The Duke Blue Devils football team represents Duke University in the sport of American football. The Blue Devils compete in the Football Bowl Subdivision (FBS) of the National Collegiate Athletic Association (NCAA) and the Coastal Division of the Atlantic Coast Conference (ACC). The program has 17 conference championships (7 ACC championships and 10 Southern Conference titles), 53 All-Americans, 10 ACC Players of the Year (the most in the ACC), and have had three Pro Football Hall of Famers come through the program (second in the ACC to only Miami's four). The team is currently coached by David Cutcliffe and play their home games at Wallace Wade Stadium in Durham, North Carolina. Although Duke has mostly struggled since the mid-1960s, the Blue Devils are currently undergoing a renaissance under Cutcliffe. Duke secured their first Coastal division title on November 30, 2013 with a win over arch-rival North Carolina. Additionally, the Blue Devils cracked the top 25 of the BCS standings, the AP Poll, and the Coaches' Poll during the 2013 season and very nearly scored an upset over a potent Texas A&M team in the 2013 Chick-fil-A Bowl, losing by only four points after jumping out to a 38–17 lead at halftime. In 2014, Duke followed up with a nine win season, including a victory over eventual Orange Bowl winner Georgia Tech, and another close bowl loss to 15th-ranked Arizona State in the Sun Bowl. In 2015, the Blue Devils broke through for a 44–41 overtime win over Indiana in the Pinstripe Bowl at Yankee Stadium, and followed up with a win over Northern Illinois in the 2017 Quick Lane Bowl. The Duke Blue Devils, then known as the Trinity Blue and White, first fielded a football team in 1888, coached by John Franklin Crowell. The first game against North Carolina was the first "scientific" game in the state. Trinity finished the first two seasons in their football history with records of 2–1 in 1888 and 1–1 in 1889. From 1890–1895, Trinity competed without a head coach. The 1891 team went undefeated. Trinity did not compete in football from 1895 to 1919. The Trinity Blue and White resumed football competition in 1920 under head coach Floyd J. Egan, compiling a record of 4–0–1 that season. In 1921, they finished 6–1–2 were led by James A. Baldwin, previously the head coach at Maine. In February 1922, Herman Steiner was selected as the head coach of the Trinity College football team for the 1922 season. During the 1922 football season, Steiner coached the Trinity football team to a 7–2–1 record as the team outscored its opponents 156 to 57. E. L. Alexander took over the reins of the Trinity Blue Devils in 1923 and led the team to a 5–4 record. In their first season competing as Duke University, Howard Jones took over in 1924 and led the Blue Devils to a 4–5 record before leaving for USC. Former Indiana head coach James Herron led the Blue Devils to another 4–5 record in 1925. From 1926 to 1930, the program was led by head coach James DeHart who compiled a 24–23–2 record during his tenure. DeHart led the Blue Devils, an independent for all of its history up to that point, into the Southern Conference in 1928. In late 1930, Wallace Wade shocked the college football world by leaving national powerhouse Alabama for Duke. He had been at Alabama since 1923, after assisting Dan McGugin's Vanderbilt Commodores during two undefeated southern championships. An upset by the Florida Gators in 1923 is all that stopped Alabama from a conference title in Wade's first year. In 1924 he won the SoCon title, and in 1925 and 1926 won national championships. His 1925 team was the first Southern team to win a Rose Bowl. Wade was under fire at Alabama after lackluster seasons in 1928 and 1929, which included narrow losses to Robert Neyland's Tennessee Volunteers. Wade submitted his resignation on April 30, with the caveat that he coach next season. John Suther described the feeling before the Tennessee game that year, which Alabama won 18–6. "Coach Wade was boiling mad. He was like a blood-thirsty drill sergeant anyway, and those critics made him more fiery ... He challenged us to help him shut up the loudmouths that were making his life miserable." In his final year at Alabama, Wade won his third national championship. Though Wade refused to answer questions regarding his decision to leave Alabama for Duke until late in his life, he eventually told a sports historian he believed his philosophy regarding sports and athletics fit perfectly with the philosophy of the Duke administration and that he felt being at a private institution would allow him greater freedom. Wade's success at Alabama translated well to Duke's program. He sent former Alabama players and future Duke assistants Herschel Caldwell and Ellis Hagler to the school a year early to prepare a team. Duke won 7 Southern Conference championships in the 16 years that Wade was coach. He also led the team to 2 Rose Bowls. Wade served a stint in the military in World War II, leaving the team after the 1941 season and returning before the start of the 1946 season. Wade's achievements placed him in the College Football Hall of Fame. In 1933, Duke, led by North Carolina's first first-team All-American Fred Crawford, upset Neyland's Tennessee Volunteers by a score of 10–2. It was Tennessee's first loss in over two and a half seasons. It caused Neyland to say of Crawford: "He gave the finest exhibition of tackle play I have ever seen." The most famous Duke football season came in 1938, when the "Iron Dukes" went unscored upon for the entire regular season. Duke reached their first Rose Bowl appearance, where they lost 7–3 when Southern California scored a touchdown in the final minute of the game on a pass from a second-string quarterback to a third string tight end. While Wallace Wade was serving in the military, Duke football assistant coach Eddie Cameron was promoted to head coach to fill in for Wade until his return from service. Cameron's Blue Devils teams were successful, going 25–11–1 in Cameron's four seasons as head coach, highlighted by an 8–1 1943 season. Cameron's 1944 team won the Sugar Bowl, beating Alabama 29–26. Cameron would go on to serve as Duke's athletic director from 1951–1972, and for his service to the athletics program and the university as a whole, Duke named their basketball arena after him, Cameron Indoor Stadium, where the Blue Devils basketball teams still play their home games today. Duke would be invited again to make the trip to Pasadena, California for the 1942 Rose Bowl, this time to play Oregon State. Due to fears of additional west coast attacks by the Japanese in the wake of Pearl Harbor, the decision was made to move the game to Durham. As Duke's stadium was significantly smaller than the regular venue, bleachers were borrowed from North Carolina State University and the University of North Carolina, which boosted capacity from 35,000 to 55,000. Despite being 3 to 1 favorites, the Iron Dukes would lose the game 20 to 16. Wade retired after the 1950 season and, for his great achievements, Duke named their football stadium after him. The Blue Devils still play their home games at Wallace Wade Stadium. Wade's final record at Duke is 110–36–7. Delaware head coach Bill Murray was chosen to replace Wallace Wade as Duke's head coach in 1951. The football program proved successful under Murray's tutelage, winning six of the first ten ACC football championships from 1953 to 1962. From 1943 until 1957, the Blue Devils were ranked in the AP Poll at some point in the season. Murray's Duke teams would be last successes the Blue Devils football program would have for another two decades. Bill Murray would be the last Duke head football coach to leave the Blue Devils with a winning record until Steve Spurrier, and the last to leave Duke after having won multiple conference championships. After Murray's retirement following the 1965 season, Duke's football program would steadily decline into becoming the ACC's "cellar-dweller". Murray led Duke to its last bowl appearance and conference championships, shared or outright, until 1989. Murray's final record at Duke was 91–51–9 in fifteen seasons. Murray led the Blue Devils to a 5–4–1 record in his first season. The 1951 campaign began with a wins over South Carolina and Pittsburgh. The game against Pittsburgh, was broadcast by NBC, and was the first nationally televised sporting event in American history. After losing to #16 Tennessee, the Blue Devils won their next two over NC State and Virginia Tech. Murray's squad then lost to Virginia, tied #5 Georgia Tech, lost to Wake Forest, lost to William & Mary and beat North Carolina. In 1952, in what was their last season as members of the Southern Conference, Duke went 8–2. The Blue Devils started the season by defeating Washington & Lee, SMU, #11 Tennessee, South Carolina, NC State and #9 Virginia. The Blue Devils suffered their first loss of the season in their seventh game of the season against Georgia Tech and lost again the next week to Navy. Murray's team closed the season with wins over Wake Forest and North Carolina. The Blue Devils were awarded the Southern Conference championship in their last season as members of the conference. Duke, along with the University of North Carolina, University of Virginia, North Carolina State University, Wake Forest University, Clemson University, the University of South Carolina and the University of Maryland chartered the Atlantic Coast Conference on May 8, 1953. In 1953, Duke finished its football season with a 7–2–1 record. The Blue Devils, who began the season ranked #10 in the country, started with wins over South Carolina, Wake Forest, Tennessee and Purdue. After losing a thriller to Army, The Blue Devils blew out NC State and Virginia. The Blue Devils then tied Navy in a scoreless bout. Murray's Duke team closed the 1953 season with a 13–10 loss to #12 Georgia Tech and a 35–20 win over archrival North Carolina. The Blue Devils won the first ever ACC football championship in 1953. The Blue Devils compiled an 8–2–1 record in 1954. Beginning the season ranked #19 nationally, the Blue Devils annihilated Pennsylvania by a score of 52–0 and defeated Tennessee in a thriller by a score of 7–6 to start the season at 2–0. The Blue Devils then tied #5 Purdue and lost to #18 Army. The Blue Devils won their next two over NC State and Georgia Tech, scoring 21 points in both games. After losing to #19 Navy, the Blue Devils won their last four of the season; defeating Wake Forest by a score of 28–21, South Carolina by a score of 26–7, North Carolina by a score of 47–12 and Nebraska in the Orange Bowl by a score of 34–7, the Blue Devils' first bowl appearance since 1945. For the second straight year, Duke won the ACC conference championship. The Blue Devils finished 7–2–1 in 1955. Murray's team began the season 4–0 with wins over NC State, Tennessee, William & Mary and #14 Ohio State. Duke lost its next two to Pittsburgh and #12 Georgia Tech. After tying #9 Navy, The Blue Devils capped the season with wins over South Carolina, Wake Forest and North Carolina. The Blue Devils were awarded their third straight ACC championship in 1955. In 1956, Duke finished 5–4–1. The Blue Devils lost to South Carolina to kick off the season. Duke then defeated Virginia by a score of 40–7 to record its first win of the season. After losing to #9 Tennessee, Duke defeated #19 SMU by a score of 14–6. Duke then lost to #16 Pittsburgh by a score of 27–14. After shutting out NC State by a score of 42–0, Murray's squad lost by a score of 7–0 to #2 Georgia Tech. Duke finished the season by tying Navy, defeating Wake Forest and defeating North Carolina. Murray led the Blue Devils to a 6–3–2 record in 1957. Duke won its first five to start the season; topping South Carolina, Virginia, Maryland, #15 Rice and Wake Forest. Murray's team then tied NC State, lost to Georgia Tech and tied #7 Navy. After defeating #14 Clemson, Duke lost to North Carolina in the regular season finale by a score of 21–13. Ranked #11 nationally, Duke received a berth in the Orange Bowl, losing to #4 Oklahoma by a score of 48–21. The Blue Devils went 5–5 in 1958. They lost their first two games of the season to South Carolina and Virginia. Duke then won their next two; defeating Illinois and Baylor. After losing to #12 Notre Dame, Murray's men beat NC State by a score of 20–13. Next, Duke dropped consecutive games to Georgia Tech by a score of 10–8 and #1 LSU by a score of 50–18. Duke finished by winning their last two over Wake Forest and #17 North Carolina. Duke went 4–6 in 1959. Out of the gate, the Durham Dukies lost their first two to #14 South Carolina and #12 Ohio State. After defeating Rice by a score of 24–7, the Blue Devils dropped their next two to Pittsburgh and Army. Duke won their next two over NC State and #9 Georgia Tech. After losing to #10 Clemson, Duke closed the disappointing season with a 27–15 victory over Wake Forest and a blowout loss to North Carolina by a score of 50–0. The Blue Devils improved to 8–3 in 1960. Murray led his team to victory in the season's first two games over South Carolina and Maryland. After losing to Michigan, the Blue Devils won their next five; defeating NC State, Clemson, Georgia Tech, #4 Navy and Wake Forest. After dropping their last two regular season games to North Carolina and UCLA, Duke, ranked #11, defeated #7 Arkansas by a score of 7–6 in the Cotton Bowl. The Blue Devils won the ACC Championship that season. After defeating the Razorbacks in Dallas, Texas, it would be over a half century until the Blue Devils won another bowl game. Duke compiled a 7–3 record in 1961. Murray's team began the season with wins over South Carolina, Virginia and Wake Forest. The Blue Devils then lost their next two to Georgia Tech and Clemson. The Blue Devils then defeated NC State by a score of 17–6. After losing to Michigan the following week, Duke finished the season on a three-game winning streak; beating Navy, North Carolina and Notre Dame. Murray and his squad were awarded a second straight ACC championship in 1961, the fifth during Murray's tenure as head coach. The Blue Devils went 8–2 in 1962. Beginning the season ranked #8 nationally, the Blue Devils lost their season opener to USC by a score of 14–7 in their first meeting with the Trojans since the 1939 Rose Bowl. Duke rebounded to win their next five; topping South Carolina, Florida, California, Clemson and NC State. After losing to Georgia Tech by a score of 20–9, the Blue Devils won their last three to finish the season; beating Maryland by a score of 10–7, Wake Forest by a lopsided 50–0 (Duke's largest margin of victory over a conference opponent in its history) and North Carolina by a score of 16–14. Duke won its third straight ACC championship in 1962, their sixth under Murray. Duke compiled a 5–4–1 record in 1963. Beating South Carolina, Virginia and Maryland to kick off the season; the Blue Devils tied California in the season's fourth game. Despite defeating Clemson 35–30 the next week, the Blue Devils dropped two in a row after the Clemson win to NC State and Georgia Tech. Duke then defeated Wake Forest by a score of 39–7 during which Duke's defense set the school record for most interceptions in one game. The Blue Devils finished the season with losses to #2 Navy and North Carolina on Thanksgiving. Murray led Duke to a 4–5–1 record in 1964. After tying South Carolina in the season opener, the Blue Devils reeled off four straight wins; topping Virginia, Maryland, NC State and Army. However, Duke finished the season on a five-game losing streak; dropping contests to #8 Georgia Tech, Wake Forest (the Blue Devils' first loss to the Demon Deacons in 13 years), Navy, North Carolina and Tulane. Bill Murray's last season in 1965 resulted in a 6–4 mark. The Blue Devils began the year on a high note, winning their first four over Virginia, South Carolina, Rice and Pittsburgh. Like the season before, the Blue Devils suffered through a multi-game losing streak, this time a four-game skid; beginning with Clemson in an ugly 3–2 defensive struggle. Losses to Illinois, Georgia Tech and NC State. The Blue Devils finished the 1965 campaign with wins over Wake Forest and North Carolina. After Murray came Tom Harp, who had a 22–28–1 record in 5 seasons with the Blue Devils. A very successful high school coach, Harp came to Duke after a mediocre stint as Cornell's head football coach. Harp's teams struggled on the field, only producing one winning season, a 6–5 1970 season that would be Harp's last at Duke, as he was fired following the season. In 1966, the Blue Devils finished 5–5. The Blue Devils began the season on a three-game winning streak; defeating West Virginia, Pittsburgh and Virginia. The Blue Devils would then drop their next four; losing to Maryland, Clemson, NC State and #6 Georgia Tech. After defeating Navy, the Blue Devils traveled to South Bend, Indiana for a showdown against #1 Notre Dame. The Blue Devils lost by a score of 64–0. The Blue Devils would close the season with a win over archrival North Carolina. In 1967, the Blue Devils finished 4–6. After defeating Wake Forest in the season opener, Duke lost to Michigan by a score of 10–7. After losing to South Carolina, the Blue Devils defeated Army and Virginia. Duke then lost its next three to Clemson, #5 NC State and Georgia Tech. After defeating Navy in Norfolk, Virginia, the Blue Devils would close the season with a 20–9 loss to North Carolina. Harp led the Blue Devils to another 4–6 record in 1968. Duke began the season with a victory over South Carolina in the season opener. Michigan defeated Duke in the second game of the season by a score of 31–10. Next, Duke beat Maryland by a score of 30–28. The Blue Devils then lost their next three; to Virginia, Clemson and Army. Duke then defeated Georgia Tech, lost to NC State, defeated Wake Forest and lost to North Carolina. In 1969, Duke went 3–6–1. The Blue Devils began the season with three straight losses; first to South Carolina by a score of 27–20, then to Virginia by a score of 10–0 and to Pittsburgh by a score of 14–12. After defeating Wake Forest, Duke lost to Maryland and tied NC State. After losing to Georgia Tech, the Blue Devils defeated Clemson, lost to Virginia Tech and beat North Carolina. In 1970, Duke finished 6–5. Duke travelled to Gainesville, Florida to face #15 Florida to kick off the season. The Blue Devils lost by a score of 21–19. Next, Duke defeated Maryland and Virginia before travelling to Columbus, Ohio for a showdown against #1 Ohio State, a game the Blue Devils lost by a score of 34–10. The following week, Duke upset #11 West Virginia and followed that with wins over NC State and Clemson. After losing their next two to Georgia Tech and Wake Forest the Blue Devils defeated South Carolina and lost to North Carolina. Mike McGee returned to his alma mater from East Carolina to serve as head football coach in late 1970. Duke continued in the mediocrity and sub-par on-the-field performances that had been seen under Harp, going 37–47–4 overall. McGee's two best years were 1971 and 1974, in which his Duke teams went a mediocre 6–5. McGee was dismissed after the 1978 season. McGee led the Blue Devils to a 6–5 record in his first season. Duke began the season strong, winning its first four and five of its first six. Future NFL offensive linesman Ed Newman played as an offensive lineman and defensive lineman, and was a Football All-American in 1971 and a Football All-ACC in 1971 and 1972. However, Duke would lose to Navy and Georgia Tech in consecutive weeks before getting what would be its final win of the season against West Virginia. McGee's Blue Devils lost its last two games of the season to Wake Forest and North Carolina. In 1972, Duke finished 5–6. Duke began the season with losses to #7 Alabama, #12 Washington and #19 Stanford. After defeating Virginia, the Blue Devils lost to NC State. Duke then won its next four, defeating Clemson, Maryland, Navy and Georgia Tech. The Duke Blue Devils lost its last two games of the season to Wake Forest and #16 North Carolina. In 1973, the Blue Devils finished 2–8–1. After losing to #9 Tennessee and defeating Washington to start the season, the Blue Devils embarked upon a six-game losing streak before tying Wake Forest. The last game of the season saw the Blue Devils defeat North Carolina by a score of 27–10. The 1974 season saw the Blue Devils go 6–5. After dropping the season opener to NC State, Duke won four straight; defeating South Carolina, Virginia, Purdue and Army. Duke then lost consecutive games to Clemson and #12 Florida. After defeating Georgia Tech and Wake Forest the next two weeks, Duke closed the season with losses to Maryland and North Carolina. In 1975, the Blue Devils struggled to a 4–5–2 mark. McGee took his Blue Devils to Los Angeles, California for a showdown against #4 USC, a game Duke lost by a score of 35–7. After beating Virginia, Duke lost to Pittsburgh. After defeating Army and Clemson, the Blue Devils lost to #12 Florida and Georgia Tech. Duke then defeated Wake Forest and tied NC State and North Carolina. In 1976, the Dukies finished 5–5–1. After kicking off the season with a road win over Tennessee, the Blue Devils lost to South Carolina. Duke then defeated Virginia and lost to #2 Pittsburgh. After defeating Miami, Duke tied Clemson. After losing to #6 Maryland the following week, the Dukies closed the season by beating Georgia Tech, losing to Wake Forest, beating NC State and losing to North Carolina. The 1977 campaign would result in a 5–6 record. McGee's squad began the season with losses to East Carolina and #1 Michigan in Ann Arbor, Michigan. Then, Duke won three straight; beating Virginia, Navy and South Carolina. After dropping back-to-back games to Clemson and Maryland, the Blue Devils defeated Georgia Tech and Wake Forest. McGee's squad closed the 1977 season with losses to NC State and North Carolina. McGee's final season in 1978 would result in a 4–7 record. After defeating Georgia Tech and South Carolina to begin the campaign, the Blue Devils traveled to Ann Arbor, Michigan for another game against #4 Michigan, and lost to the Wolverines by a score of 52–0. The next week, Duke beat Virginia but then lost their next four. After defeating Wake Forest, Duke lost its last two to NC State and North Carolina. Elon head coach Shirley "Red" Wilson replaced McGee and went 16–27–1 as Duke's head football coach. Wilson's teams only won two games in his first two seasons, then had back-to-back 6–5 records. Wilson's teams became known for their innovative passing attack under offensive coordinator Steve Spurrier, whose 1982 offense featuring quarterback Ben Bennett set a school record for yardage before Wilson retired and Spurrier left to become the head coach of the USFL's Tampa Bay Bandits. Wilson led the Blue Devils to a 2–8–1 record in his first season. Duke began the season with a victory over East Carolina. That was followed by a loss to South Carolina, a loss to Virginia, a tie against Army, a win over Richmond, and losses to Clemson, Maryland Georgia Tech, #20 Wake Forest, NC State and North Carolina. In 1980, Duke compiled a 2–9 record. After losing their first five games to start the season, the Blue Devils defeated Clemson by a score of 34–17. After losing to Maryland, the Blue Devils lost their last three to close the season. In 1981, Wilson led the Blue Devils to an improved 6–5 record. The Blue Devils began the season with losses to #11 Ohio State and South Carolina before winning three straight. After losing to #6 Clemson and Maryland, the Blue Devils won three straight before losing to North Carolina in the regular season finale. Wilson's last season in 1982 was a 6–5 campaign. The Blue Devils started the season with three straight wins before losing to four straight. The Blue Devils then beat Georgia Tech and Wake Forest before losing to NC State and defeating North Carolina. Duke's 1982 team, with Steve Spurrier serving as offensive coordinator, was the first in Atlantic Coast Conference history to average more than 300 passing yards per game. There was hope when Steve Sloan was hired that the Duke football program would finally return to its glory days under Wallace Wade. Sloan played quarterback for Bear Bryant at Alabama in the 1960s and had winning records as the head football coach at both Vanderbilt and Texas Tech, two programs that had struggled prior to his arrival, and also served as head coach at Ole Miss. However, Sloan could not translate his successes from those places to Duke. Sloan's Blue Devils teams had a 13–31 overall record in the four seasons he was there, failing to win more than four games in a single season. Sloan resigned after four seasons as Duke head coach to become athletics director at the University of Alabama. Sloan led the Blue Devils to a 3–8 record in his first season. The season began with seven consecutive losses before the Dukies won their first game of the season over Georgia Tech, which was the first in a three-game winning streak. The Blue Devils defeated Wake Forest the following week and followed that with a 27–26 win over NC State. The Blue Devils lost by a score of 34–27 to North Carolina in the last game of the 1983 season. The 1984 season was a 2–9 struggle. After defeating Indiana in the season opener, the Blue Devils lost their next eight. Duke finally broke through with their second win of the season in the season's next-to-last game over NC State by a score of 16–13. Duke lost in their annual regular season finale bout against North Carolina by a score of 17–15. In 1985, Duke slightly improved to a 4–7 record. Sloan's Blue Devils began the season with a victory over Northwestern, then lost to West Virginia and beat Ohio. After losing six straight, the Blue Devils won their last two, defeating NC State and North Carolina. Duke duplicated their 4–7 mark in 1986, Sloan's last season in Durham. The Blue Devils defeated Northwestern for the second straight year in the season opener, Duke lost to Georgia by a score of 31–7. The Blue Devils then won their next two, defeating Ohio and Virginia. After losing their next four, Sloan's squad defeated Wake Forest. Duke lost its last two of the season to NC State and North Carolina. The Duke Blue Devils football program had a string of successful years in the late 1980s when the team's head coach was Steve Spurrier. Spurrier won the Heisman Trophy as a quarterback at Florida in 1966 and had served as an assistant with the Gators, Georgia Tech and Duke as well as head coach of the United States Football League's Tampa Bay Bandits. Duke was Spurrier's first college head coaching position. When Spurrier arrived as Duke's 17th head football coach in program history, he inherited a Duke program that was commonly viewed as the worst football program in the ACC. The Duke football program had not been to a bowl game in more than a quarter-century, since 1960. Unlike most of his predecessors since Wallace Wade, Spurrier was able to have success as Duke's head football coach. He hired coaches Ian Goodall, Joe Jeb, and Patrick Cooke to serve as assistant coaches. Spurrier led the Blue Devils to a share of the ACC title in 1989, its first ACC football title of any kind, shared or outright, since the Bill Murray era. Spurrier won ACC Coach of the Year honors in 1988 and 1989 for his achievements. He led Duke to the 1989 All-American Bowl, a game they lost 49–21 to Texas Tech. That bowl appearance was the program's first bowl appearance since the 1960 Cotton Bowl. Spurrier's first season in 1987 resulted in a 5–6 record. The Blue Devils began the season with three wins; defeating Colgate, Northwestern and Vanderbilt. Spurrier's squad then suffered through a four-game losing streak. After defeating Georgia Tech on Halloween, Duke lost its next two before defeating North Carolina in the season finale. Spurrier's squad began the 1988 season by defeating Northwestern, Tennessee, The Citadel, Virginia and Vanderbilt. After losing to #11 Clemson and Maryland, the Blue Devils defeated Georgia Tech, tied NC State and defeated North Carolina. Spurrier's last season in 1989 was an 8–4 mark. Duke began their season by losing to South Carolina, defeating Northwestern, losing to #17 Tennessee and losing to Virginia. The following week, Spurrier's Blue Devils stunned #7 Clemson by a score of 21–17 that would begin a seven-game winning streak. The win is Duke's last win over a top 10 ranked opponent to date. Duke followed up the Clemson win with wins over Army, Maryland, Georgia Tech, Wake Forest, #22 NC State and North Carolina (by a score of 41–0). The Blue Devils then made their first bowl appearance since 1960 in the All-American Bowl, losing to Texas Tech by a score of 49–21. In what would become a recurring trend at most of his coaching stops, Spurrier's teams regularly beat their biggest rivals while he brashly "needled" them with jokes and "zingers" that were amusing to his fans but infuriating to opponents. Spurrier's Duke squads went 3–0 against archrival North Carolina, including a 41–0 victory in Chapel Hill that clinched a share of the 1989 ACC title. At Spurrier's suggestion, that win was followed by a joyful team picture taken in front of the Kenan Memorial Stadium scoreboard, a photo that still rankles some Tar Heel supporters. After three seasons and a 20–13–1 overall record, and leading the Blue Devils to seemingly unheard of football success, Spurrier left Duke after the 1989 season to accept the head football coaching position at his alma mater Florida, where he would cement his legacy as one of college football's greatest head coaches. Spurrier is the last head football coach to date to leave Duke with a winning record. The 1989 ACC Title was the last title, shared or outright, won not only by Duke, but also by any school in the state of North Carolina until Wake Forest won their second ACC Title in 2006. Barry Wilson was promoted from assistant coach and took over the Blue Devils football program after the departure of Steve Spurrier, but struggled with a 13–30–1 record in four seasons despite inheriting a team that had shared an ACC championship the season before he became the head coach. Unable to duplicate or build upon the successes of his predecessor, Wilson resigned as head coach after the 1993 season. In 1990, the Blue Devils finished with a 4–7 record. Duke began the season with a loss to South Carolina and a victory over Northwestern. After consecutive losses to #10 Virginia and #19 Clemson, Wilson's Dukies defeated Army and Western Carolina. Duke then lost to Maryland and #16 Georgia Tech before defeating Wake Forest. The Blue Devils finished the season with losses to NC State and North Carolina. In 1991, Duke finished 4–6–1. They began the season with a tie to South Carolina. The Blue Devils then won their next two, defeating Rutgers and Colgate. They then lost to Virginia by a score of 34–3. After defeating Vanderbilt and Maryland in consecutive weeks by a score of 17–13, the Blue Devils lost their last five to close the season. In 1992, Duke went 2–9. Duke began the season with a 48–21 loss to ACC newcomer Florida State. Duke then went 2–2 over the next four games, losing to Vanderbilt, beating Rice, losing to #14 Virginia, and beating East Carolina. Duke lost its last five games of the season to close out the 1992 campaign. Wilson's last season in 1993 was a 3–8 mark. Duke kicked off the season against #1 Florida State, losing 45–7. After losing to Rutgers the next week, Duke defeated Army to win its first game of the season. Duke next lost its next four, starting with #22 Virginia and #11 Tennessee. Duke dropped games to Clemson and Maryland during the latter half of the four-game losing streak. Duke closed the season with two wins and two losses, defeating Wake Forest, losing to Georgia Tech, defeating #22 NC State, and losing to #13 North Carolina. On December 16, 1993, Rice head coach Fred Goldsmith was named Wilson's replacement, becoming the Blue Devils' 19th head football coach. Goldsmith arrived in Durham as a twenty-year coaching veteran who had served nine years as defensive coordinator/associate head coach under Ken Hatfield; four years at Air Force and five years at Arkansas. In addition to the five-year head coaching stint at Rice, Goldsmith had served one year as the head coach at Slippery Rock University, an NCAA Division II school located in Slippery Rock, Pennsylvania. Under Goldsmith, the Blue Devils compiled a 17–39 record in five seasons. The Blue Devils rose to prominence again in 1994. The team raced out to an 8–1 record, and was briefly ranked as high as #13 in the country before losing the last two heart-breaking games of the season 24–23 to North Carolina State and 41–40 to arch-rival North Carolina by missing two extra-point attempts. The 1994 team played in the program's first New Years Day Bowl game since 1961, falling to Wisconsin 34–21 in the 1995 Hall of Fame Bowl, later known as the Outback Bowl. After 1994, however, Duke's football program continued to decline, with the team lacking a winning season the remainder of Goldsmith's tenure. Goldsmith's teams struggled after that 1994 season, failing to win more than four games in a single season. In 1995, the Blue Devils finished 3–8. They began their season with a loss to #1 Florida State by a score of 70–26. After defeating Rutgers and Army, Duke lost its next five before defeating Wake Forest. This would be the last conference win until the Blue Devils beat Wake Forest again three seasons later. They then lost their last two to #24 Clemson and North Carolina. Goldsmith's 1996 Duke team went 0–11. In 1997, the Blue Devils went 2–9. The Blue Devils lost to NC State and Northwestern to start the season, then they broke their losing streak, defeating Army and Navy in consecutive weeks for their only wins of the season. Duke lost to Maryland, #4 Florida State, Virginia, Wake Forest, Clemson, Georgia Tech and #8 North Carolina to close the season. The Blue Devils compiled a 4–7 record in 1998. Duke won its first two out of the gate, rolling over Western Carolina and Northwestern. Goldsmith's squad lost then lost three in a row, dropping contests to #11 Florida State, #11 Virginia and Georgia Tech. The Blue Devils broke the ACC losing streak with a win against Wake Forest. They managed one more conference win against Clemson and finished the season with losses to Maryland and North Carolina. Goldsmith was fired after the 1998 season with a 17–39 overall record as head coach of the Blue Devils. On December 1, 1998, his 38th birthday, Carl Franks, offensive coordinator at Florida under former Blue Devils head coach Steve Spurrier, was hired to replace Fred Goldsmith and tasked with turning around the Duke football program. A Duke alum, Franks had also served as running backs coach at Duke under Spurrier from 1987–1989 and had played running back and tight end for the Blue Devils under Shirley Wilson from 1980–1982. The hiring was well-received and applauded, as Franks had overseen one of college football's most potent and explosive offenses that helped the Gators win the national championship in 1996, coached a Heisman Trophy winner in Danny Wuerffel and had many players drafted into the National Football League. Franks led the Blue Devils to a 3–8 record in 1999. The Franks era began with losses to East Carolina, Northwestern, Vanderbilt and #1 Florida State. The Blue Devils won their first game of the season in their fifth game of the season against Virginia. After consecutive losses to #8 Georgia Tech and NC State, Duke went 2–2 in the last four games; beating Maryland, losing to Clemson, beating Wake Forest, and losing to North Carolina. From 2000 to 2001 Duke suffered a 22-game losing streak, with both the 2000 and 2001 seasons being winless 0–11 campaigns, with only four of the 22 losses coming by eight points or fewer. During the streak, Franks, when asked what the team's problems were, was quoted as saying "Winning football games has certainly been harder than I anticipated." Duke finished 2–10 in 2002. The Blue Devils ended their long losing streak spanning two full seasons in the season opener against East Carolina by a score of 23–16. Duke then dropped its next three to Louisville, Northwestern, and #5 Florida State before defeating Navy by a score of 43–17. It would prove to be Duke's last win of the season, as the Blue Devils lost its last seven to finish the year. Duke went 4–8 in 2003. #18 Virginia defeated the Blue Devils in the season opener by a score of 27–0. After defeating Western Carolina and Rice the next two weeks, Duke lost its next six games, prompting the athletics administration to dismiss Franks as head coach after losing to Wake Forest. Defensive coordinator Ted Roof was appointed interim head coach. The Blue Devils' 1999–2001 teams were ranked 7th in a list on the 10 worst college football teams of all time by ESPN's Page 2. After going 7–45 in four full seasons and a partial fifth, Franks was fired and replaced by his defensive coordinator Ted Roof. Despite the poor record, Franks was lauded for the academic success of his players, evidenced by his program winning the Academic Achievement Award from the American Football Coaches Association in 2003. Ted Roof was elevated from defensive coordinator and named interim Duke head coach for the final five games of the 2003 season. The Blue Devils won two of their last three games of the season, Roof's interim tag was removed, and he was named the program's 21st head football coach in 2004. Roof's good times did not last, as he also struggled mightily as Duke's head coach, compiling a dismal 6–45 record before his firing after four seasons and a partial fifth. One positive aspect, however, from Roof's tenure was that Duke defenses consistently ranked in the top 30 in tackles for loss for the first time in years. Roof would go on to win a national championship as Auburn's defensive coordinator in 2010 under head coach Gene Chizik. Roof led the Blue Devils to a 2–9 record in 2004. Roof's squad began the season with four straight losses to Navy, UConn, Virginia Tech and #23 Maryland. The Blue Devils earned their first win of the season in their fifth game of the season against FCS opponent The Citadel. Duke then suffered through another four-game losing streak; losing to Georgia Tech, #14 Virginia, Wake Forest and #13 Florida State. Duke then beat Clemson and lost to North Carolina to cap the season. In 2005, the Blue Devils finished 1–10 The Blue Devils started with losses to East Carolina and #7 Virginia Tech before winning their only contest of the season over FCS opponent VMI. Duke finished the season with losses to #23 Virginia, Navy, #9 Miami, Georgia Tech #11 Florida State, Wake Forest, Clemson and North Carolina. After a winless 0–12 campaign in 2006, the 2007 team finished 1–11. Roof led his squad to a 1–11 record in his final season. Duke began the season with losses to UConn and Virginia. After defeating Northwestern to snap a 22-game losing streak, Duke dropped its last nine games to Navy, Miami, Wake Forest, #12 Virginia Tech, Florida State, Clemson, Georgia Tech, Notre Dame and North Carolina. In December 2007, Tennessee offensive coordinator and former Ole Miss head coach David Cutcliffe was hired as Duke's 22nd head football coach. Cutcliffe had a reputation for being an outstanding offensive mind and quarterbacks coach, as he had helped develop both Peyton and Eli Manning. As offensive coordinator under head coach Phillip Fulmer with the Tennessee Volunteers, he oversaw an explosive offense that helped the Volunteers win the 1998 national championship. In 2008, a judge ruled in favor of Duke after they pulled out of a four-game contract with the University of Louisville; the judge stated that it was up to Louisville to find a suitable replacement as, he wrote in the ruling, Duke's lawyers had persuasively argued that any Division I team would be equivalent or better. Duke went 4–8 in 2008 and Duke's 2009 season was a 5–7 record, the closest the school had come to bowl eligibility since 1994. In January 2010, following Lane Kiffin's abrupt departure for USC after one season as head coach at Tennessee, Cutcliffe, an assistant coach for the Volunteers for twenty years, quickly emerged as a leading candidate to replace Kiffin. Cutcliffe, however, ultimately rebuffed Tennessee's overtures, remaining at Duke and stating, "After much thought and consideration, Karen and I reached the decision that Duke is the place for our family. We have both family members and lifetime friends in the Knoxville community and share a deep respect for the University of Tennessee. Our ties to the school and the eastern Tennessee area are obvious. But before Tennessee's hiring process comes to a conclusion, I know that Duke University is where I want to coach." The position eventually went to Derek Dooley. Cutcliffe's decision was widely lauded as a rare example of commitment and integrity among prominent college football coaches. Cutcliffe's Duke teams had back-to-back 3–9 seasons in 2010 and 2011. Duke's 2012 team, despite low preseason expectations, after a 33–30 win against rival North Carolina became bowl eligible for the first time since 1994. Extending its season to December 27, 2012, Duke fell to Cincinnati 48–34 in a close contest in the Belk Bowl, finishing the season with a 6–7 record. On November 21, 2012, Duke extended Cutcliffe's contract through June 2019. Duke's 2013 season was a break-out year, as the Blue Devils have continued to cross off many of their infamous losing streaks. On October 26, 2013, Duke achieved its first win over a ranked team since 1994 with a 13–10 victory over #14 Virginia Tech at Lane Stadium in Blacksburg, Virginia, a rarity for the Duke football program. That win over Virginia Tech was also Duke's first road win over a ranked team since 1971. Following a bye week, on November 9, 2013 the Blue Devils achieved their first winning season since 1994 with a 38–20 home victory over in-state rival NC State, their seventh of the season. Extending its winning streak to 6 straight by defeating #24 Miami 48–30 on November 16, Duke appeared in the AP Poll for the first time since 1994, listed at #25 with a record of 8–2. With a win at Wake Forest on November 23, 2013, Duke claimed its ninth victory in a regular season for the first time since 1941, the season in which the Blue Devils hosted the Rose Bowl. The win also gave Duke at least a share of the Coastal Division title and a #24 AP Poll ranking. With a 27–25 win over North Carolina on November 30, 2013, Duke locked up their first 10-win season in school history, the Coastal Division title, and a spot in the 2013 ACC Championship Game against Florida State, during which time Duke was ranked #20. The Blue Devils lost that game to the Seminoles, the eventual national champions, by a score of 45–7. 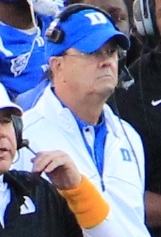 David Cutcliffe received the Walter Camp Coach of the Year award in 2013. The Blue Devils were invited to the Chick-fil-A Bowl, where they lost another close, hard-fought game 52–48 to Texas A&M to finish the season with a record of 10–4. After the 2013 season, offensive coordinator Kurt Roper left Duke to accept the same position on Will Muschamp's staff at Florida. With Scottie Montgomery in his first season as offensive coordinator, Duke finished 9–4 in 2014. The Blue Devils began the season with four wins; defeating Elon, Troy, Kansas and Tulane. Cutcliffe's squad suffered its first defeat in the season's fifth game against Miami. Duke then won its next four; defeating #22 Georgia Tech (the team's first victory over the Yellow Jackets in a decade), Virginia, Pittsburgh and Syracuse. After dropping consecutive games to Virginia Tech and North Carolina, The Blue Devils closed the regular season with a win over Wake Forest. Duke was offered and accepted a berth in the Sun Bowl, a game they lost to #15 Arizona State by a score of 36–31. Wide receiver Jamison Crowder was the team's star player and would be drafted in the fourth round in the 2015 NFL Draft by the Washington Redskins. Crowder finished his career tied for the most receptions in ACC football history with 283 for 3,641 yards and 23 touchdowns. He also returned a school-record four punt returns for touchdowns. Cutcliffe's success at Duke placed him as a candidate in several head coaching searches, including at Michigan (a job that eventually went to Jim Harbaugh) and Louisville (a job that eventually went to Bobby Petrino). 2015 would see the Blue Devils finish 8–5. Duke began the season with wins over Tulane and NC Central. After losing to #23 Northwestern, the Blue Devils won their next four; defeating #20 Georgia Tech, Boston College, Army and Virginia Tech (in a four-overtime thriller). Cutcliffe's team then embarked upon a four-game losing streak; beginning with a controversial loss to Miami. The Hurricanes used eight laterals (reminiscent of the 1982 Cal-Stanford ending) on a kickoff return with no time remaining to score the game-winning touchdown and stun the Blue Devils by a score of 30–27. However, video evidence showed the play should have been blown dead and not counted as a touchdown, as Miami players who possessed the ball on that play's knee were shown to be on the ground more than once. Although the outcome of the game couldn't be changed, the Atlantic Coast Conference subsequently suspended the game and replay officials for failing to catch the errors and make the correct call. Duke then lost games to #21 North Carolina by a score of 66–31, Pittsburgh by a score of 31–13 and Virginia by a score of 42–34. Duke concluded the regular season by snapping its four-game losing streak in a 27–21 win over Wake Forest. Duke finished the season by winning its first bowl game since 1961, defeating Indiana in overtime by a score of 44–41 in the Pinstripe Bowl. After the 2015 season, offensive coordinator Scottie Montgomery left the Blue Devils to accept the head coaching position at East Carolina. To replace Montgomery, Cutcliffe promoted Zac Roper to offensive coordinator. 2015 also marked the beginning of a $100 million renovation project to Wallace Wade Stadium. These renovations were initiated in an attempt to attract higher rated recruiting prospects and improve the overall fan experience. These renovations include, a new press box, new increased seating capacity, as well as new concourse and public area modifications. These changes began with the first phase in 2015 with the conclusion on the last home game. These initial changes consisted of dropping the field itself several feet down. This allowed the new stadium seats to be built into the newly created area cleared out by the field being dropped by over 6 feet. The second part of phase 1 was to clear the old existing press box. After this was concluded, there was a temporary press box built to house all media and stadium personnel during the 2015 season. After the conclusion of the 2015–2016 season phase 2 began. This phase consisted of building the new press box as well as a new scoreboard. This phase was concluded by the beginning of the 2016 season. Phase 3, which is the final phase in the project, will be concluded during the beginning of the 2016–2017 football season. This final phase consisted of finishing the renovation to the concourse area's as well as the entrances to the stadium itself. This construction, which is being carried out by The Beck Group is still underway and is expected to be concluded before the start of the 2016–2017 season. Cutcliffe's Blue Devils struggled to a 4–8 record in 2016. Duke kicked off the season with a 49–6 win over NC Central. After losing to Wake Forest and Northwestern the next two weeks, the Blue Devils upset Notre Dame in South Bend, Indiana in the season's fourth game by a score of 38–35. The win was big for the Blue Devils. The Irish, one of college football's most consistent and storied national powers, came into the contest as 21-point favorites at home and suffered one of the worst defeats in their history. Duke then lost to Virginia and beat Army in messy conditions due to Hurricane Matthew. Next, the Blue Devils lost their next three to #7 Louisville, Georgia Tech and #23 Virginia Tech. After upsetting archrival #15 North Carolina, the Blue Devils closed the season with losses to Pittsburgh and Miami. On May 1, 2017, Duke again extended Cutcliffe's contract, keeping their head coach in Durham through June 30, 2021. Duke finished 7–6 in 2017. They started the season on September 2 with a 60–7 victory over in-state Football Championship Subdivision opponent NC Central. In the season's second game, the Blue Devils defeated Northwestern by a margin of 41–17. Duke then defeated Baylor by a score of 34–20 to pick up their third victory of the season. Cutcliffe's squad improved to 4–0 after a 27–17 victory over archrival North Carolina on September 23. Then, the Blue Devils embarked upon a six-game losing streak, beginning with a 31–6 loss to #14 Miami. On October 7, Duke lost to Virginia by a margin of 28–21. The next week, they lost to Pittsburgh by a score of 24–17. The Blue Devils' fifth straight loss came on October 28 in the form of a 24–3 defeat at the hands of #13 Virginia Tech. After a 21–16 loss to Army, Cutcliffe's Blue Devils snapped their skid with a 43–20 win over Georgia Tech. In the regular season finale, the Blue Devils picked up their sixth win and attained bowl eligibility with a 31–23 win over rival Wake Forest. Duke accepted a berth in the 2017 Quick Lane Bowl, where they defeated Northern Illinois by a score of 36–14. Duke does not officially claim any national championships. The 1936 team was retroactively named national champions by Berryman (QRPS), a mathematical rating system designed by Clyde P. Berryman in 1990. The NCAA recognizes the Berryman title in its official NCAA Football Bowl Subdivision records. James Howell, a football historian, also selected Duke as 1936 national champions using his Football Power Ratings formula. Ray Bryne, a minor selector, chose the 1941 Blue Devils as national champions. † The 1936 Berryman (QRPS) title is recognized by the NCAA. Duke also won the 1965 ACC Championship on the field, finishing tied for first with South Carolina (who they defeated) at 4–2. However, South Carolina was later discovered to have used two ineligible players, and were required by the conference to forfeit their four league victories. This elevated NC State and Clemson (both of whom had lost to South Carolina) to 5–2 in the standings, ahead of 4–2 Duke. Duke still claims the 1965 ACC Championship, although the conference does not recognize it. Duke has a 6–8 record in their 14 bowl games. The Blue Devils traditional all-sport rivalry is with the North Carolina Tar Heels. In football, the teams fight for the Victory Bell each year. The trophy series is 40–21–1 in favor of North Carolina. The overall series is 58–36–4 in favor of North Carolina. Duke maintains a rivalry with Wake Forest. The series is 54–37–2 in favor of Duke. Duke maintains a Research Triangle rivalry with NC State. The series with NC State is 40–36–5 in favor of Duke. Brooks Field at Wallace Wade Stadium is a 40,004-seat stadium on the campus of Duke University in Durham, North Carolina, United States. Primarily used for American football, it is the home field of the Duke Blue Devils. It opened in 1929 with a game against Pitt, as the first facility in Duke's new West Campus. Originally named Duke Stadium, it was renamed in 1967 for former head football coach Wallace Wade and has remained Wallace Wade Stadium ever since. The field was named Brooks Field at the beginning of the 2015 season after the removal of track and lowering of the field level seats. The stadium is notable for being the site of the 1942 Rose Bowl Game. Duke had won the invitation to the game as the eastern representative. However, the attack on Pearl Harbor, just weeks after the end of the 1941 season, led to fears of a Japanese attack on the West Coast. General John L. DeWitt, commander of the Western Defense Command, advised the Tournament of Roses Association not to hold the game at the Rose Bowl Stadium itself, since he was not willing to take a chance on the Japanese choosing to stage a bombing raid on a stadium with over 90,000 people in attendance. Soon afterward, the government banned all large public gatherings on the West Coast, which ruled out Bell Field on the campus of Oregon State, the host team from the PCC, as an alternative venue. The Tournament of Roses Association originally planned to cancel the game, but Duke officials invited the Rose Bowl and Oregon State to Durham to play the game. The offer was accepted, and on a cold, rainy January 1, 1942, 56,000 fans, 22,000 of whom sat on bleachers borrowed from nearby NC State and UNC, watched the heavily favored Blue Devils fall to the strong defense of the Beavers 20–16. It is still the only time the game has been played outside of Pasadena, California. In September 2014, renovation plans were released. The new stadium would seat nearly 40,000 and have 21 luxury suites housed within a new five-story, 90,000 square foot tower along the stadium's west side. A new 42 feet high by 75.6 feet wide LED video board would be installed 90 feet closer to the field than the previous one. Another notable feature was the removal of the stadium's track, which allowed 4,000 additional seats to be added along with lowering and recentering the field. The concourses along the stadium's north and west sides were enhanced with new concessions and new gates, restroom facilities and first aid stations. Integrated seating in compliance with the Americans with Disabilities Act were also added for disabled guests and their companions. The first two phases of the renovations were finished over a two-year period, including the new press box, eight broadcast booths and suites completed by the 2016 college football season. Phase three is to be completed prior to the 2017 season. It includes completion of ADA boxes currently in one-third of the concourse on the north and east concourse, rebuilding the concourse surface, and construction of a north gate ticket booth and various concessions, bathroom, and future store buildings on the east concourse. The alumni box on the north concourse will also be replaced with a new auxiliary scoreboard. Duke is consistently ranked at or near the top of the list of Division I-A schools which graduate nearly all of their football players. Duke has topped the list 12 years in a row, earning it the most Academic Achievement Awards of any university. Duke has had an American Football Coaches Association's Academic Achievement Award winner in '81, '84, '87, '90, '93, '94, '95, '96, '97, '99, '03, '05, '14, making it one of the schools with the most winners. Since 1962, Duke has only appeared in the polls during 1971, 1989, 1994, 2013, 2014 and 2015. The only time Duke has ever been ranked by the BCS was 2013; it was ranked #24 in the final BCS standings that year. However, Duke had been ranked in the CFP when the CFP Rankings replaced the BCS rankings. They were ranked in the CFP during the very first year the CFP replaced the BCS. They finished the season unranked, but earlier in the 2014 Duke Blue Devils football team season, they were ranked in the CFP for 3 straight weeks, the first week, they were #24. The second week, they were ranked #22. The third week, they were ranked #21. The fourth week, they dropped from the CFP rankings, because they lost to unranked Virginia Tech. Duke has never been ranked #1 in the AP or Coaches polls. ^ Colleges – Pro Football Hall of Fame Archived April 18, 2008, at the Wayback Machine. Pro Football Hall of Fame, 2007. Retrieved on June 12, 2007. ^ a b Mcdonald, Amy (July 14, 2013). "John Franklin Crowell (1857–1931)". library.duke.edu. ^ "The Game and the Bell | David M. Rubenstein Rare Book & Manuscript Library". Library.duke.edu. November 20, 1998. Retrieved June 19, 2017. ^ "Champions of the South regardless of conference affiliation". ^ Jim L. Sumner (1990). "John Franklin Crowell, Methodism, and the Football Controversy at Trinity College, 1887–1894" (PDF). Journal of Sport History. 17 (1). ^ "Trinity College To Have Football Season". Winstom-Salem Journal. July 25, 1920. ^ Roth, John (September 29, 2017). "The Encyclopedia of Duke Basketball". Duke University Press – via Google Books. ^ "Trinity Gets Local Coach". The Atlanta Constitution. February 5, 1922. ^ "Fine Staff for Trinity". The Atlanta Constitution. September 17, 1922. ^ "1922 Duke". College Football Data Warehouse. ^ The Chanticleer for 1923. Duke University. pp. 147, 149. ^ Trinity College Alumni Association (September 29, 2017). "Trinity alumni register [serial]". Durham, N.C. : Trinity College Alumni Association – via Internet Archive. ^ "1925 Duke Blue Devils Schedule and Results - College Football at Sports-Reference.com". College Football at Sports-Reference.com. ^ "Jimmy DeHart Coaching Record - College Football at Sports-Reference.com". College Football at Sports-Reference.com. ^ a b "The History of the Southern Conference". Retrieved August 5, 2018. ^ Jonathan Fravel (September 16, 2010). "Alabama Legend: How Did Wallace Wade End Up at Duke?". Bleacher Report. Retrieved June 19, 2017. ^ "The Night Bear Bryant Came to Town: Football Coaching Legends at Vanderbilt | Vanderbilt Magazine | Vanderbilt University". News.vanderbilt.edu. Retrieved June 19, 2017. ^ "1923 Football Archives – RollTide.com – University of Alabama Official Athletics Site". Rolltide.Com. Retrieved June 19, 2017. ^ "1923 Alabama Football Schedule". Saturdaydownsouth.com. Retrieved June 19, 2017. ^ "1924 Football Archives – RollTide.com – University of Alabama Official Athletics Site". Rolltide.Com. Retrieved June 19, 2017. ^ "1928 Alabama Football Schedule". Saturdaydownsouth.com. Retrieved June 19, 2017. ^ "1929 Football Season Archive – Rolltide.com – RollTide.com – University of Alabama Official Athletics Site". Rolltide.Com. July 25, 2006. Retrieved June 19, 2017. ^ "Wallace Wade a common thread for Bama, Duke | AL.com". Blog.al.com. Retrieved June 19, 2017. ^ "Alabama-Tennessee: A Southern Tradition". October 23, 2008. Archived from the original on February 12, 2015. ^ "Alabama Football". Bryant Museum. June 18, 1990. Retrieved June 19, 2017. ^ a b c d e f g h i j Jonathan Fravel. "Alabama Legend: How Did Wallace Wade End Up at Duke?". Bleacher Report. ^ "The Launching of Duke University, 1924–1949 – Robert Franklin Durden – Google Books". Books.google.com. Retrieved June 19, 2017. ^ "Wallace Wade". College Football at Sports-Reference.com. ^ "Frederick A. "Fred" Crawford, Jr. – Duke University Blue Devils | Official Athletics Site". GoDuke.com. December 14, 2005. Retrieved June 19, 2017. ^ Curtis, Brian (September 27, 2016). "Fields of Battle: Pearl Harbor, the Rose Bowl, and the Boys Who Went to War". Flatiron Books – via Google Books. ^ "Frederick A. "Fred" Crawford". ^ Theresa Jensen Lacey (2002). Amazing North Carolina. p. 79. ISBN 9781418538408. ^ "Scouts Line Up Stars On Grid Fronts". The Evening Independent. October 25, 1933. ^ "History". Iron Dukes. Retrieved June 19, 2017. ^ "Duke Bowl Recap: 1939 Rose Bowl – USC 7, Duke 3 – Duke University Blue Devils | Official Athletics Site". GoDuke.com. August 25, 2016. Retrieved June 19, 2017. ^ "Nave Dies; USC's Hero in '39 Game – latimes". Articles.latimes.com. December 11, 1990. Retrieved June 19, 2017. ^ a b c d e "Edmund M." goduke.com. ^ "1943 Duke Blue Devils Schedule and Results | College Football at Sports-reference.com". January 1, 1970. Retrieved June 19, 2017. ^ "The Durham Rose Bowl, 1942 | David M. Rubenstein Rare Book & Manuscript Library". Library.duke.edu. Retrieved June 19, 2017. ^ "War and Roses: The 1942 Rose Bowl rallied a rattled country". Retrieved August 5, 2018. ^ Kalland, Robby (August 20, 2015). "LOOK: Renovations almost complete at Duke's Wallace Wade Stadium". CBSSports.com. Retrieved June 19, 2017. ^ "Wallace Wade Coaching Record | College Football at". Sports-reference.com. January 1, 1970. Retrieved June 19, 2017. ^ "Bill Murray". Footballfoundation.org. Retrieved June 19, 2017. ^ "William D. "Bill" Murray – Duke University Blue Devils | Official Athletics Site". GoDuke.com. December 14, 2005. Retrieved June 19, 2017. ^ Duke Blue Devils. Theacc.com. Retrieved on June 12, 2007. ^ a b "Bill Murray". College Football at Sports-Reference.com. ^ a b c d e f "William D." goduke.com. ^ "1951 Duke Blue Devils Schedule and Results - College Football at Sports-Reference.com". College Football at Sports-Reference.com. ^ "Florence Morning News from Florence, South Carolina on September 24, 1951 · Page 6". Retrieved August 5, 2018. ^ Barnes, Cliff (September 22, 2010). "Duke was part of historic football game 59 years ago". Retrieved August 5, 2018. ^ "Surging Panthers host Duke at Heinz Field this Saturday". University of Pittsburgh. Retrieved August 5, 2018. ^ "Chicago Tribune – Historical Newspapers". Retrieved August 5, 2018. ^ "1951 Tennessee Football Schedule". August 18, 2014. Retrieved August 5, 2018. ^ "College Football 1951 Games". www.phys.utk.edu. Retrieved August 5, 2018. ^ "Football Game Notes: at Virginia Tech, Nov. 22, 5:30 PM, ESPNU". Retrieved August 5, 2018. ^ a b c d e f g "mcubed.net : NCAAF Football : Series records : Virginia vs. Duke". www.mcubed.net. ^ "1952-10-25 – Georgia Tech vs. Vanderbilt – Georgia Tech Ticket Stubs". georgiatechticketstubs.com. ^ a b c "Duke Football Game Notes: vs. Georgia Tech, Nov. 10, 1 PM". Retrieved August 5, 2018. ^ a b c d e f g h "mcubed.net : NCAAF Football : Series records : Duke vs. Wake Forest". www.mcubed.net. ^ "University of North Carolina ... football blue book for press and radio". Chapel Hill, N.C. : University News Bureau, 1947–1979. September 29, 2017 – via Internet Archive. ^ "1952 Duke Blue Devils Schedule and Results - College Football at Sports-Reference.com". College Football at Sports-Reference.com. ^ "Duke Football vs. Washington and Lee (September 20, 1952) (FB-000539) – Finding Databases – Rubenstein Library". library.duke.edu. ^ Boyles, Bob; Guido, Paul (September 29, 2017). "The USA Today College Football Encyclopedia". Skyhorse Publishing Inc. – via Google Books. ^ "1952 Tennessee Football Schedule". August 18, 2014. Retrieved August 5, 2018. ^ "Rocky Mount Evening Telegram Newspaper Archives, Oct 12, 1952, p. 33". October 12, 1952. Retrieved August 5, 2018. ^ "Florence Morning News from Florence, South Carolina on October 19, 1952 · Page 18". Retrieved August 5, 2018. ^ "Duke vs. Georgia Tech, 1952 Nov 1". Duke Digital Collections. ^ a b "mcubed.net : NCAAF Football : Series records : Navy vs. Duke". www.mcubed.net. ^ "Duke Football at Wake Forest (November 15, 1952) (FB-000484) – Finding Databases – Rubenstein Library". library.duke.edu. ^ "North Carolina Tar Heels 1952 Football Schedule – Tar Heel Times". www.tarheeltimes.com. ^ "History of the Atlantic Coast Conference (Chatham Journal)". www.chathamjournal.com. ^ "1953 Duke Blue Devils Schedule and Results - College Football at Sports-Reference.com". College Football at Sports-Reference.com. ^ "1953 Duke vs South Carolina". July 25, 2014. Retrieved August 5, 2018. ^ "Duke Football vs. Wake Forest (September 26, 1953) (FB-000533) – Finding Databases – Rubenstein Library". library.duke.edu. ^ "1953 Tennessee Football Schedule". August 18, 2014. Retrieved August 5, 2018. ^ "College Football 1953 Games". www.phys.utk.edu. Retrieved August 5, 2018. ^ "Chloroformed Goats and Stolen Mules: The Army-Navy Mascot Wars". December 11, 2015. Retrieved August 5, 2018. ^ "NC State Athletics – 1953 Football Schedule". gopack.com. ^ "Duke Football – Virginia (1953) (FB-000534) – Finding Databases – Rubenstein Library". library.duke.edu. ^ a b "Duke Sports Film – Search Results". library.duke.edu. ^ "1953-11-21 – Georgia Tech vs. Duke – Georgia Tech Ticket Stubs". georgiatechticketstubs.com. ^ "North Carolina Tar Heels 1953 Football Schedule – Tar Heel Times". www.tarheeltimes.com. ^ a b c d e "Duke's ACC Championships". Retrieved August 5, 2018. ^ "1954 Duke Blue Devils Schedule and Results - College Football at Sports-Reference.com". College Football at Sports-Reference.com. ^ "Duke Routs Penn with Rushing, 52–0; Second-Stringers Set Pace as Blue Devils Score Five Times in Last Quarter". mobile.nytimes.com. ^ Schanche, Don A. "GAME OF THE WEEK: DUKE 7 TENNESSEE 6". Retrieved August 5, 2018. ^ "1954 Orange Bowl: Duke 34, Nebraska 7". Retrieved August 5, 2018. ^ "Army West Point Athletics – 1954 Football Schedule". goarmywestpoint.com. ^ "NC State Athletics – 1954 Football Schedule". gopack.com. ^ "Duke Football vs. Georgia Tech (October 30, 1954) (FB-000436) – Finding Databases – Rubenstein Library". library.duke.edu. ^ a b c "Duke entertains Navy this Saturday (Chatham Journal)". www.chathamjournal.com. ^ "Wilson Daily Times Newspaper Archives, Nov 24, 1954, p. 11". November 24, 1954. Retrieved August 5, 2018. ^ a b c "mcubed.net : NCAAF Football : Series records : Duke vs. South Carolina". www.mcubed.net. ^ "North Carolina Tar Heels 1954 Football Schedule – Tar Heel Times". www.tarheeltimes.com. ^ "1950s – History – Orange Bowl". game.orangebowl.org. ^ "Duke Bowl History". Retrieved August 5, 2018. ^ "1955 Duke Blue Devils Schedule and Results - College Football at Sports-Reference.com". College Football at Sports-Reference.com. ^ "NC State Athletics – 1955 Football Schedule". gopack.com. ^ "1955 Tennessee Football Schedule". August 18, 2014. Retrieved August 5, 2018. ^ "William & Mary – One man's guide to Tribe football's greatest 11". www.wm.edu. ^ "The Courier-Journal from Louisville, Kentucky on October 23, 1955 · Page 30". Retrieved August 5, 2018. ^ "1955-10-29 – Georgia Tech vs. Duke – Georgia Tech Ticket Stubs". georgiatechticketstubs.com. ^ a b "The Index-Journal from Greenwood, South Carolina on December 3, 1955 · Page 3". Retrieved August 5, 2018. ^ "Wilson Daily Times Newspaper Archives, Nov 21, 1955, p. 9". November 21, 1955. Retrieved August 5, 2018. ^ "North Carolina Tar Heels 1955 Football Schedule – Tar Heel Times". www.tarheeltimes.com. ^ "1956 Duke Blue Devils Schedule and Results - College Football at Sports-Reference.com". College Football at Sports-Reference.com. ^ "1956 South Carolina Football Schedule". August 18, 2014. Retrieved August 5, 2018. ^ "1956 Tennessee vs Duke". July 22, 2014. Retrieved August 5, 2018. ^ "Duke vs. SMU, 1956 – Vintage College Football Programs". vintagecollegefootballprograms.com. Retrieved August 5, 2018. ^ "mcubed.net : NCAAF Football : Series records : Pittsburgh vs. Duke". www.mcubed.net. ^ "Duke Football vs. NC State (October 27, 1956) (FB-000524) – Finding Databases – Rubenstein Library". library.duke.edu. ^ "Notebook: Duke Opens ACC Play vs. Georgia Tech". Retrieved August 5, 2018. ^ "Duke Football vs. Navy (November 10, 1956) (FB-000522) – Finding Databases – Rubenstein Library". library.duke.edu. ^ "Duke Football vs. Wake Forest (November 17, 1956) (FB-000505) – Finding Databases – Rubenstein Library". library.duke.edu. ^ "North Carolina Tar Heels 1956 Football Schedule – Tar Heel Times". www.tarheeltimes.com. ^ "1957 Duke Blue Devils Schedule and Results - College Football at Sports-Reference.com". College Football at Sports-Reference.com. ^ "Sports Back Then with Scott Nunn". Retrieved August 5, 2018. ^ "Duke Football vs. Virginia (September 28, 1957) (FB-000521) – Finding Databases – Rubenstein Library". library.duke.edu. ^ "Duke Football vs. Maryland (October 5, 1957) (FB-000518) – Finding Databases – Rubenstein Library". library.duke.edu. Retrieved August 5, 2018. ^ "Football, 1957: Duke". August 7, 2012. Retrieved August 5, 2018. ^ "Duke Football vs. Wake Forest (October 19, 1957) (FB-000520) – Finding Databases – Rubenstein Library". library.duke.edu. Retrieved August 5, 2018. ^ "NC State Athletics – 1957 Football Schedule". gopack.com. Retrieved August 5, 2018. ^ "1957-11-02 – Georgia Tech vs. Duke – Georgia Tech Ticket Stubs". georgiatechticketstubs.com. ^ "Football seemed touched with a high-scoring flavor in the country's major games except the midfield tug-of-war staged by Navy and Duke at Baltimore. That ended in a 6–6 tie". Retrieved August 5, 2018. ^ a b c "Clemson vs. Duke Football Game Notes :: College Sports Official Athletic Site". www.cstv.com. Retrieved August 5, 2018. ^ "North Carolina Tar Heels 1957 Football Schedule – Tar Heel Times". www.tarheeltimes.com. ^ "1958 – Orange Bowl". game.orangebowl.org. ^ "1958 Duke Blue Devils Schedule and Results - College Football at Sports-Reference.com". College Football at Sports-Reference.com. Retrieved August 5, 2018. ^ "South Carolina Gamecocks – College Football (NCAA)". michigan-football.com. ^ "College Football 1958 Games". www.phys.utk.edu. ^ "Duke Football vs. Illinois (October 4, 1958) (FB-000494) – Finding Databases – Rubenstein Library". library.duke.edu. ^ "Duke vs. Baylor, 1958 Oct 11". Duke Digital Collections. ^ "NC State Athletics – 1958 Football Schedule". gopack.com. ^ a b c d e f g h i j k l m n o p "mcubed.net : NCAAF Football : Series records : Duke vs. Georgia Tech". www.mcubed.net. ^ Terrell, Roy. "The Bandits of Baton Rouge". Retrieved August 5, 2018. ^ Hyman, Mervin. "Football's 9th Week". Retrieved August 5, 2018. ^ "North Carolina Tar Heels 1958 Football Schedule – Tar Heel Times". www.tarheeltimes.com. ^ "1959 Duke Blue Devils Schedule and Results - College Football at Sports-Reference.com". College Football at Sports-Reference.com. ^ "1959 South Carolina Football Schedule". August 18, 2014. Retrieved August 5, 2018. ^ "College Football 1959 Games". www.phys.utk.edu. ^ "The Pittsburgh Press from Pittsburgh, Pennsylvania on October 7, 1959 · Page 55". Retrieved August 5, 2018. ^ "Army West Point Athletics – 1959 Football Schedule". www.goarmywestpoint.com. ^ "NC State Athletics – 1959 Football Schedule". gopack.com. ^ "1959-11-07 – Georgia Tech at Notre Dame – Georgia Tech Ticket Stubs". georgiatechticketstubs.com. ^ "Golden Anniversary Of A Memorable Win". Retrieved August 5, 2018. ^ "1960 Duke Blue Devils Schedule and Results - College Football at Sports-Reference.com". College Football at Sports-Reference.com. ^ a b c "Looking Back... A Look Inside Duke's Gridiron Success in the Early 1960's". Retrieved August 5, 2018. ^ "Year-By-Year Results 1960–Present". Retrieved August 5, 2018. ^ "November 20, 1960 (vol. 71, iss. 54) – Image 6". Michigan Daily Digital Archives. ^ "NC State Athletics – 1960 Football Schedule". gopack.com. ^ a b c "mcubed.net : NCAAF Football : Series records : Duke vs. Clemson". www.mcubed.net. ^ "Duke Football vs. Georgia Tech (October 29, 1960) (FB-000441) – Finding Databases – Rubenstein Library". library.duke.edu. ^ "College Football 1960 Games". www.phys.utk.edu. ^ "Duke's Cotton Bowl Champs Celebrate 50th Anniversary". Retrieved August 5, 2018. ^ "Duke Bowl Recap: 1961 Cotton Bowl – Duke 7, Arkansas 6". Retrieved August 5, 2018. ^ "Duke aims for first bowl win since 1961 Cotton Bowl". Retrieved August 5, 2018. ^ "Duke wins first bowl game in 54 years on controversial FG ruling". Retrieved August 5, 2018. ^ "1961 Duke Blue Devils Schedule and Results - College Football at Sports-Reference.com". College Football at Sports-Reference.com. ^ "Duke Football Game Notes: at Virginia, Sept. 8, 12 PM, Lincoln Financial Sports". Retrieved August 5, 2018. ^ Hyman, Mervin. "No weekend for the favorites". Retrieved August 5, 2018. ^ "This Day in ACC History: October 14, 1961". October 14, 2014. Retrieved August 5, 2018. ^ a b c d e "Clemson vs. Duke Football Game Notes". Retrieved August 5, 2018. ^ "NC State Athletics – 1961 Football Schedule". gopack.com. ^ "Wolverine NOT Football / Day: 5 / Decade: 1960 / Year: 1961 – Michigan Daily Digital Archives – Search Results". digital.bentley.umich.edu. ^ "Star Tribune from Minneapolis, Minnesota on November 12, 1961 · Page 52". Retrieved August 5, 2018. ^ "North Carolina Tar Heels 1961 Football Schedule – Tar Heel Times". www.tarheeltimes.com. ^ "Duke-Notre Dame Football Series Extended". Retrieved August 5, 2018. ^ "1962 Duke Blue Devils Schedule and Results - College Football at Sports-Reference.com". College Football at Sports-Reference.com. ^ "USC Official Athletic Site – USCTrojans.co m". usctrojans.com. ^ "The Gamecock – University of South Carolina". sc-newspapers.sc.edu. ^ "1962 Duke vs Florida". June 28, 2014. Retrieved August 5, 2018. ^ "Duke Football vs. NC State (October 27, 1962) (FB-000399) – Finding Databases – Rubenstein Library". library.duke.edu. ^ a b c "Duke Football Game Notes: vs. Wake Forest, Oct. 6, 1 PM". Retrieved August 5, 2018. ^ "North Carolina Tar Heels 1962 Football Schedule – Tar Heel Times". www.tarheeltimes.com. ^ "Blue Zone – The Chronicle". The Chronicle. ^ "1963 Duke Blue Devils Schedule and Results - College Football at Sports-Reference.com". College Football at Sports-Reference.com. ^ "The Greenville News from Greenville, South Carolina on September 22, 1963 · Page 37". Retrieved August 5, 2018. ^ Hyman, Mervin. "Sublime weekend for the underdogs". Retrieved August 5, 2018. ^ "Duke Sports Film – Search Results". library.duke.edu. ^ "NC State Athletics – 1963 Football Schedule". gopack.com. ^ "Staubach reflects on his eventful season with Navy football in 1963". December 13, 2013. Retrieved August 5, 2018. ^ "Extra Points: '63 Team Turns 50". Retrieved August 5, 2018. ^ "1964 Duke Blue Devils Schedule and Results - College Football at Sports-Reference.com". College Football at Sports-Reference.com. ^ "1964 South Carolina Football Schedule". August 17, 2014. Retrieved August 5, 2018. ^ "Duke Football vs. Virginia (September 26, 1964) (FB-000214) – Finding Databases – Rubenstein Library". library.duke.edu. ^ "Ground Attack Decisive". October 18, 1964 – via www.nytimes.com. ^ "College Football 1964 Games". www.phys.utk.edu. ^ "The Times from Shreveport, Louisiana on November 1, 1964 · Page 18". Retrieved August 5, 2018. ^ "ESPN Classic – Piccolo led Wake to '64 win over Duke". www.espn.com. ^ "DUKE IS UPSET BY WAKE FOREST". November 8, 1964 – via www.nytimes.com. ^ "The Daily Tar Heel from Chapel Hill, North Carolina on November 15, 1964 · Page 8". Retrieved August 5, 2018. ^ "North Carolina Tar Heels 1964 Football Schedule – Tar Heel Times". www.tarheeltimes.com. ^ "TulaneGreenWave.com – Tulane Athletics". tulanegreenwave.com. ^ "1965 Duke Blue Devils Schedule and Results - College Football at Sports-Reference.com". College Football at Sports-Reference.com. ^ "College Football 1965 Games". www.phys.utk.edu. ^ "USC football's lost title team of 1965". Retrieved August 5, 2018. ^ "Duke Faces Rice In Houston On September 8 :: Kickoff Set For 8:00 EDT". goduke.cstv.com. ^ "1965 Pitt Football – The End of an Era". Retrieved August 5, 2018. ^ "1965 Tigers – 50th Anniversary". Retrieved August 5, 2018. ^ "NC State Athletics – 1965 Football Schedule". gopack.com. ^ "Duke Football vs. Wake Forest (November 13, 1965) (FB-000321) – Finding Databases – Rubenstein Library". library.duke.edu. ^ "North Carolina Tar Heels 1965 Football Schedule – Tar Heel Times". www.tarheeltimes.com. ^ a b "Tom Harp". College Football at Sports-Reference.com. ^ "The Free Lance-Star – Google News Archive Search". google.com. ^ "Herald-Journal – Google News Archive Search". google.com. ^ "1966 Duke Blue Devils Schedule and Results | College Football at". Sports-reference.com. January 1, 1970. Retrieved June 19, 2017. ^ Rousos, Rick (October 17, 1970). "A 'Driving' Experience With The Mountaineers – News – The Ledger – Lakeland, FL". The Ledger. Retrieved June 19, 2017. ^ Porterville, Kevin. "ACC Football: Pittsburgh Panthers vs No. 24 Duke Blue Devils Preview". Bcsnn.com. Retrieved June 19, 2017. ^ "Duke Football vs. Virginia (October 1, 1966) (FB-000336) | Finding Databases | Rubenstein Library". Library.duke.edu. October 1, 1966. Retrieved June 19, 2017. ^ "Year-By-Year Results 1960–Present – Maryland Terrapins Athletics – University of Maryland Terps Official Athletic Site". Umterps.com. Retrieved June 19, 2017. ^ "1966 Team: 50-Year Anniversary – Clemson Tigers Official Athletics Site". Clemsontigers.com. Retrieved June 19, 2017. ^ "The Danville Register from Danville, Virginia on October 23, 1966 · Page 39". Newspapers.com. October 23, 1966. Retrieved June 19, 2017. ^ "Duke vs. Georgia Tech, Now Live! – Duke University Blue Devils | Official Athletics Site". GoDuke.com. November 14, 2009. Retrieved June 19, 2017. ^ "The Courier-Journal from Louisville, Kentucky on November 6, 1966 · Page 49". Newspapers.com. November 6, 1966. Retrieved June 19, 2017. ^ "November 13, 1966 – Irish Crush Duke, 64–0; Spartans Whip Hoosiers, 37–19 | Chicago Tribune Archive". Archives.chicagotribune.com. November 13, 1966. Retrieved June 19, 2017. ^ "North Carolina Tar Heels 1966 Football Schedule". Tar Heel Times. Retrieved June 19, 2017. ^ "1967 Duke Blue Devils Schedule and Results | College Football at". Sports-reference.com. January 1, 1970. Retrieved June 19, 2017. ^ "Wake Forest Visits Death Valley – Wake Forest Football". WakeForestSports.com. Retrieved June 19, 2017. ^ Staton Enterprises, LLC. "Michigan Football Game History 1931 to Present". Michiganfootballgames.com. Retrieved June 19, 2017. ^ "Michigan Daily Digital Archives – September 17, 1967 (vol. 78, iss. 16) – Image 6". Digital.bentley.umich.edu. Retrieved June 19, 2017. ^ "1967 South Carolina Football Schedule". Saturdaydownsouth.com. Retrieved June 19, 2017. ^ "Army – 1967 Football Schedule". www.goarmywestpoint.com. ^ "Devils Football Takes On Seventh Ranked Seminoles". Retrieved August 5, 2018. ^ "The Daily Independent from Kannapolis, North Carolina on November 17, 1967 · Page 11". Retrieved August 5, 2018. ^ "NC State Athletics – 1967 Football Schedule". gopack.com. ^ Hyman, Mervin. "FOOTBALL'S WEEK". Retrieved August 5, 2018. ^ "North Carolina Tar Heels 1967 Football Schedule – Tar Heel Times". www.tarheeltimes.com. ^ "1968 Duke Blue Devils Schedule and Results - College Football at Sports-Reference.com". College Football at Sports-Reference.com. ^ "October 01, 1968 (vol. 79, iss. 28) – Image 11". Michigan Daily Digital Archives. ^ "mcubed.net : NCAAF Football : Series records : Duke vs. Maryland". mcubed.net. ^ "Arizona Republic from Phoenix, Arizona on October 20, 1968 · Page 132". Retrieved August 5, 2018. ^ "Army – 1968 Football Schedule". www.goarmywestpoint.com. ^ "Georgia Tech Historical Scores". www.jhowell.net. ^ "NC State Athletics – 1968 Football Schedule". gopack.com. ^ "North Carolina Tar Heels 1968 Football Schedule – Tar Heel Times". www.tarheeltimes.com. ^ "1969 Duke Blue Devils Schedule and Results - College Football at Sports-Reference.com". College Football at Sports-Reference.com. ^ "1969 Duke vs South Carolina". June 18, 2014. Retrieved August 5, 2018. ^ "The 1969 Gamecocks: The one. The only". Retrieved August 5, 2018. ^ "The Pittsburgh Press from Pittsburgh, Pennsylvania on October 5, 1969 · Page 80". Retrieved August 5, 2018. ^ a b "mcubed.net : NCAAF Football : Series records : Duke vs. Maryland". www.mcubed.net. ^ "NC State Athletics – 1969 Football Schedule". gopack.com. ^ "Duke Football Game Notes: vs. Virginia Tech, Oct. 13, 12 PM, Lincoln Financial Sports". Retrieved August 5, 2018. ^ "North Carolina Tar Heels 1969 Football Schedule – Tar Heel Times". www.tarheeltimes.com. ^ "1970 Duke Blue Devils Schedule and Results - College Football at Sports-Reference.com". College Football at Sports-Reference.com. ^ "1970 Florida Football Schedule". August 17, 2014. Retrieved August 5, 2018. ^ "College Football 1970 Games". www.phys.utk.edu. ^ "Duke Historical Scores". www.jhowell.net. ^ "Duke Football vs. Virginia (September 26, 1970) (FB-000352) – Finding Databases – Rubenstein Library". library.duke.edu. ^ "OhioStateBuckeyes.com :: The Ohio State University Official Athletic Site The Ohio State University Official Athletic Site :: Football". www.ohiostatebuckeyes.com. ^ Casazza, Mike. "WVU, Pitt players remember 1970 Backyard Brawl". wvgazettemail.com. ^ "Duke Football Game Notes: vs. Clemson, Nov. 3, 12 Noon". Retrieved August 5, 2018. ^ "1970 ACC Championship Football Team – Wake Forest Deacon Club". Retrieved August 5, 2018. ^ "The Index-Journal from Greenwood, South Carolina on November 16, 1970 · Page 8". Retrieved August 5, 2018. ^ "North Carolina Tar Heels 1970 Football Schedule – Tar Heel Times". www.tarheeltimes.com. ^ "Michael B. McGee". goduke.com. ^ a b "Mike McGee". College Football at Sports-Reference.com. ^ "The Dispatch – Google News Archive Search". google.com. ^ "1971 Duke Blue Devils Schedule and Results - College Football at Sports-Reference.com". College Football at Sports-Reference.com. ^ "College Football 1971 Games". www.phys.utk.edu. ^ "mcubed.net : NCAAF Football : Team vs. Conference records : South Carolina vs. ACC". mcubed.net. ^ "Sumner: A Look Back at Duke's 1971 Win Over Stanford". Retrieved August 5, 2018. ^ "NC State Athletics – 1971 Football Schedule". gopack.com. ^ "Edward K. Newman". goduke.com. ^ "mcubed.net : NCAAF Football : Series records : Duke vs. Navy". www.mcubed.net. ^ "mcubed.net : NCAAF Football : Series records : Duke vs. West Virginia". www.mcubed.net. ^ "North Carolina Tar Heels 1971 Football Schedule – Tar Heel Times". www.tarheeltimes.com. ^ "Duke vs. University of North Carolina, 1971 Nov 20". Duke Digital Collections. ^ "1972 Duke Blue Devils Schedule and Results - College Football at Sports-Reference.com". College Football at Sports-Reference.com. ^ "1972 Alabama Football Schedule". August 17, 2014. Retrieved August 5, 2018. ^ "ROLLTIDE.COM – University of Alabama Official Athletics Site". www.rolltide.com. ^ "Duke vs. Stanford, 1972 Sep 23". Duke Digital Collections. ^ "Duke Football vs. Virginia (September 30, 1972) (FB-000365) – Finding Databases – Rubenstein Library". library.duke.edu. ^ "NC State Athletics – 1972 Football Schedule". gopack.com. ^ "Duke vs. Maryland, 1972 Oct 21". Duke Digital Collections. ^ "Duke vs. Georgia Tech, 1972 Nov 4". Duke Digital Collections. ^ "Duke vs. Wake Forest, 1972 Nov 11". Duke Digital Collections. ^ "North Carolina Tar Heels 1972 Football Schedule – Tar Heel Times". www.tarheeltimes.com. ^ "1973 Duke Blue Devils Schedule and Results - College Football at Sports-Reference.com". College Football at Sports-Reference.com. ^ "mcubed.net : NCAAF Football : Series records : Duke vs. Tennessee". www.mcubed.net. ^ "1973 - Duke Blue Devils Football Statistics and Results - Totalfootballstats.com". www.totalfootballstats.com. ^ "North Carolina Tar Heels 1973 Football Schedule – Tar Heel Times". www.tarheeltimes.com. ^ "1974 Duke Blue Devils Schedule and Results - College Football at Sports-Reference.com". College Football at Sports-Reference.com. ^ "NC State Athletics – 1974 Football Schedule". www.gopack.com. ^ "1974 Florida Football Schedule". August 16, 2014. Retrieved August 5, 2018. ^ "North Carolina Tar Heels 1974 Football Schedule – Tar Heel Times". www.tarheeltimes.com. ^ "1975 Duke Blue Devils Schedule and Results - College Football at Sports-Reference.com". College Football at Sports-Reference.com. ^ "Desert Sun 13 September 1975 — California Digital Newspaper Collection". cdnc.ucr.edu. ^ a b "mcubed.net : NCAAF Football : Series records : Duke vs. Virginia". www.mcubed.net. ^ Mackall, Dave. "Clairton grad Gombar recalls Duke-Pitt games from mid-70s". TribLIVE.com. ^ "1975 Florida Football Schedule". August 16, 2014. Retrieved August 5, 2018. ^ "NC State Athletics – 1975 Football Schedule". gopack.com. ^ "North Carolina Tar Heels 1975 Football Schedule – Tar Heel Times". www.tarheeltimes.com. ^ "1976 Duke Blue Devils Schedule and Results - College Football at Sports-Reference.com". College Football at Sports-Reference.com. ^ "1976 Duke vs Tennessee". June 15, 2014. Retrieved August 5, 2018. ^ "Nashville Then: Tennessee vs. Duke football 1976". Retrieved August 5, 2018. ^ "1976 South Carolina Football Schedule". August 16, 2014. Retrieved August 5, 2018. ^ "mcubed.net : NCAAF Football : Duke : 1976". mcubed.net. ^ "A Look Back: Duke vs. Pitt, 1976". Retrieved August 5, 2018. ^ "Football Game Notes: vs. Miami, Oct. 18, 3:30 PM, ESPNU". Retrieved August 5, 2018. ^ "Notes: Miami 52, Duke 7". Retrieved August 5, 2018. ^ "Football Game Program Feature: Most Bizarre Occurrences in Memorial Stadium History". Retrieved August 5, 2018. ^ "Duke Football vs. Maryland (October 23, 1976) (FB-000021) – Finding Databases – Rubenstein Library". library.duke.edu. ^ "Duke Football vs. Wake Forest (November 6, 1976) (FB-000023) – Finding Databases – Rubenstein Library". library.duke.edu. ^ "NC State Athletics – 1976 Football Schedule". gopack.com. ^ "Most memorable Duke-North Carolina football games". Retrieved August 5, 2018. ^ "North Carolina Tar Heels 1976 Football Schedule – Tar Heel Times". www.tarheeltimes.com. ^ "1977 Duke Blue Devils Schedule and Results - College Football at Sports-Reference.com". College Football at Sports-Reference.com. ^ "Duke vs. East Carolina, 1977 Sep 10". Duke Digital Collections. ^ "Michigan Football Saturdays: 30-year Flashback: 1977 Game Two- Mich 21 Duke 9". Retrieved August 5, 2018. ^ "mcubed.net : NCAAF Football : Duke : 1977". mcubed.net. ^ "Duke vs. Navy, 1977 Oct 1". Duke Digital Collections. ^ "1977 South Carolina Football Schedule". August 16, 2014. Retrieved August 5, 2018. ^ "Duke vs. Clemson, 1977 Oct 15". Duke Digital Collections. ^ "Football: University of Maryland (31) vs. Duke University (13), October 22, 1977 – Digital Collections @ the University of Maryland". digital.lib.umd.edu. ^ "NC State Athletics – 1977 Football Schedule". gopack.com. ^ "North Carolina Tar Heels 1977 Football Schedule – Tar Heel Times". www.tarheeltimes.com. ^ "1978 Duke Blue Devils Schedule and Results - College Football at Sports-Reference.com". College Football at Sports-Reference.com. ^ "Duke vs. Georgia Tech, 1978 Sep 9". Duke Digital Collections. ^ "1978 South Carolina Football Schedule". August 16, 2014. Retrieved August 5, 2018. ^ "1978 Football Team – University of Michigan Athletics". bentley.umich.edu. ^ "Duke vs. Wake Forest, 1978 Nov 11". Duke Digital Collections. ^ "NC State Athletics – 1978 Football Schedule". gopack.com. ^ "North Carolina Tar Heels 1978 Football Schedule – Tar Heel Times". www.tarheeltimes.com. ^ "Red Wilson". College Football at Sports-Reference.com. ^ a b "1979 Duke Blue Devils Schedule and Results - College Football at Sports-Reference.com". College Football at Sports-Reference.com. ^ a b "1980 Duke Blue Devils Schedule and Results - College Football at Sports-Reference.com". College Football at Sports-Reference.com. ^ a b "1981 Duke Blue Devils Schedule and Results - College Football at Sports-Reference.com". College Football at Sports-Reference.com. ^ a b "1982 Duke Blue Devils Schedule and Results - College Football at Sports-Reference.com". College Football at Sports-Reference.com. ^ "Red Wilson said he had no idea his contract..." Retrieved August 5, 2018. ^ "Ben Bennett". Retrieved August 5, 2018. ^ "Duke vs. East Carolina, 1979 Sep 15". Duke Digital Collections. ^ "mcubed.net : NCAAF Football : Series records : Army vs. Duke". www.mcubed.net. ^ "mcubed.net : NCAAF Football : Duke : 1979". mcubed.net. ^ "Duke vs. Maryland, 1979 Oct 27". Duke Digital Collections. ^ "NC State Athletics – 1979 Football Schedule". gopack.com. ^ "North Carolina Tar Heels 1979 Football Schedule – Tar Heel Times". www.tarheeltimes.com. ^ a b "mcubed.net : NCAAF Football : Series records : Maryland vs. Duke". www.mcubed.net. ^ "1981 South Carolina Football Schedule". August 15, 2014. Retrieved August 5, 2018. ^ Tysiac, Ken (September 29, 2017). "Tales from Clemson's 1981 Championship Season". Sports Publishing LLC – via Google Books. ^ "Duke vs Clemson Game Notes". October 31, 2005. Retrieved August 5, 2018. ^ "North Carolina Tar Heels 1981 Football Schedule – Tar Heel Times". www.tarheeltimes.com. ^ "1982 - Duke Blue Devils Football Statistics and Results - Totalfootballstats.com". www.totalfootballstats.com. ^ "Duke vs. Wake Forest, 1982 Nov 6". Duke Digital Collections. ^ "NC State Athletics – 1982 Football Schedule". gopack.com. ^ "North Carolina Tar Heels 1982 Football Schedule – Tar Heel Times". www.tarheeltimes.com. ^ Featherston, Al (November 26, 2009). "Duke Record Book Forever Changed". goduke.com. Retrieved July 30, 2016. ^ "Steve Sloan". August 18, 2014. Retrieved August 5, 2018. ^ a b c "Steve Sloan". College Football at Sports-Reference.com. ^ "The Deseret News – Google News Archive Search". news.google.com. ^ "Sports People: FOOTBALL; Sloan Resigns". August 16, 1989 – via www.nytimes.com. ^ "1983 Duke Blue Devils Schedule and Results - College Football at Sports-Reference.com". College Football at Sports-Reference.com. ^ "NC State Athletics – 1983 Football Schedule". gopack.com. ^ "North Carolina Tar Heels 1983 Football Schedule – Tar Heel Times". www.tarheeltimes.com. ^ "1984 Duke Blue Devils Schedule and Results - College Football at Sports-Reference.com". College Football at Sports-Reference.com. ^ "Pinstripe Bowl brings Duke, Indiana to Yankee Stadium – FOX Sports". December 6, 2015. Retrieved August 5, 2018. ^ "1984: The Year of Black Magic – Duke". Retrieved August 5, 2018. ^ "NC State Athletics – 1984 Football Schedule". gopack.com. ^ "North Carolina Tar Heels 1984 Football Schedule – Tar Heel Times". www.tarheeltimes.com. ^ "1985 Duke Blue Devils Schedule and Results - College Football at Sports-Reference.com". College Football at Sports-Reference.com. ^ "Nu Atones For 'Pathetic' Opening Loss". Retrieved August 5, 2018. ^ "Winsipedia – West Virginia Mountaineers vs. Duke Blue Devils football series history". Retrieved August 5, 2018. ^ "Asheville Citizen-Times from Asheville, North Carolina on September 22, 1985 · Page 30". Retrieved August 5, 2018. ^ "NC State Athletics – 1985 Football Schedule". gopack.com. ^ "North Carolina Tar Heels 1985 Football Schedule – Tar Heel Times". www.tarheeltimes.com. ^ "1986 Duke Blue Devils Schedule and Results - College Football at Sports-Reference.com". College Football at Sports-Reference.com. ^ "Northwestern University – 1986 Football Schedule". www.nusports.com. ^ "1986 UGA Football Schedule – Georgia Bulldogs". Retrieved August 5, 2018. ^ "Duke Football vs. Ohio (September 20, 1986) (FB-000093) – Finding Databases – Rubenstein Library". library.duke.edu. ^ Fowler, Scott (October 24, 1986). "Duke Pulls No Punches for Homecoming" – via www.washingtonpost.com. ^ "NC State Athletics – 1986 Football Schedule". gopack.com. ^ "North Carolina Tar Heels 1986 Football Schedule – Tar Heel Times". www.tarheeltimes.com. ^ "Steve Spurrier". July 9, 2014. Retrieved August 5, 2018. ^ a b c "Steve Spurrier". College Football at Sports-Reference.com. ^ Jacobs, Barry; Times, Special to The New York (October 7, 1989). "Duke Is Looking Smart in Football, Too" – via www.nytimes.com. ^ "1987 Duke Blue Devils Schedule and Results - College Football at Sports-Reference.com". College Football at Sports-Reference.com. ^ "1987 Duke vs. Colgate football program (Steve Spurrier's debut as Duke coach) – #460632886". Worthpoint. ^ "Northwestern University – 1987 Football Schedule". www.nusports.com. ^ "Duke vs. Vanderbilt, 1987 Sep 19". Duke Digital Collections. ^ "Duke vs. Georgia Tech, 1987 Oct 31". Duke Digital Collections. ^ "North Carolina Tar Heels 1987 Football Schedule – Tar Heel Times". www.tarheeltimes.com. ^ "Duke Travels to Evanston to Face Northwestern". Retrieved August 5, 2018. ^ "1988 Duke vs Tennessee". June 10, 2014. Retrieved August 5, 2018. ^ AP (September 11, 1988). "COLLEGE FOOTBALL: SOUTH; Tennessee Falls to 0–2 In Upset By Duke" – via www.nytimes.com. ^ "Acc Football". Retrieved August 5, 2018. ^ "Duke vs. University of Virginia, 1988 Sep 24". Duke Digital Collections. ^ "1988 Duke vs Vanderbilt". June 10, 2014. Retrieved August 5, 2018. ^ "Wilson Daily Times Newspaper Archives, Oct 20, 1988, p. 12". October 20, 1988. Retrieved August 5, 2018. ^ "NC State Athletics – 1988 Football Schedule". gopack.com. ^ "North Carolina Tar Heels 1988 Football Schedule – Tar Heel Times". www.tarheeltimes.com. ^ "1989 Duke Blue Devils Schedule and Results - College Football at Sports-Reference.com". College Football at Sports-Reference.com. ^ "1989 Duke vs South Carolina". June 10, 2014. Retrieved August 5, 2018. ^ "Duke Passer Sinks Northwestern". Retrieved August 5, 2018. ^ "The Tennessee Football Programs: 1989 Football Program – UT vs Duke". diglib.lib.utk.edu. ^ "Time Capsule: The 1989 Virginia Cavaliers". Retrieved August 5, 2018. ^ Jacobs, Barry; Times, Special to The New York (October 1, 1989). "COLLEGE FOOTBALL; Duke Rallies to Stun Clemson" – via www.nytimes.com. ^ "Steve Spurrier still remembers his time at Duke like it was yesterday". Retrieved August 5, 2018. ^ "COLLEGE FOOTBALL; Army Stunned by Duke". October 8, 1989 – via www.nytimes.com. ^ "College Football 1989 Games". www.phys.utk.edu. ^ "Duke Football vs. Georgia Tech (October 28, 1989) (FB-000127) – Finding Databases – Rubenstein Library". library.duke.edu. ^ "Postgame Notes – Wake Forest vs. Duke". Retrieved August 5, 2018. ^ "NC State Athletics – 1989 Football Schedule". gopack.com. ^ a b "North Carolina Tar Heels 1989 Football Schedule – Tar Heel Times". www.tarheeltimes.com. ^ Press, From Associated (December 29, 1989). "ALL AMERICAN BOWL : Gray Leads Texas Tech Over Duke" – via LA Times. ^ Low, Chris (May 24, 2012). "Spurrier loves speaking his mind". ESPN. Retrieved July 31, 2016. ^ Keeley, Laura (August 28, 2014). "Steve Spurrier still remembers his time at Duke like it was yesterday". The News & Observer. Retrieved July 31, 2016. ^ "Arnsparger Confirms Spurrier Hiring". tribunedigital-sunsentinel. ^ Journal, Dan Collins Winston-Salem. "A decade-old feat: Wake Forest celebrates 2006 ACC Championship". Retrieved August 5, 2018. ^ "Duke coach Wilson learns there's no place to hide". tribunedigital-baltimoresun. ^ "Barry Wilson". College Football at Sports-Reference.com. ^ "Losses Mount, Duke Coach Quits". tribunedigital-chicagotribune. ^ "1990 Duke Blue Devils Schedule and Results - College Football at Sports-Reference.com". College Football at Sports-Reference.com. ^ "1990 South Carolina Football Schedule". August 14, 2014. Retrieved August 5, 2018. ^ "Northwestern University – 1990 Football Schedule". www.nusports.com. ^ "Virginia 59, Duke 0". Retrieved August 5, 2018. ^ AP (October 7, 1990). "College Football: East; Late Duke Score Frustrates Army" – via www.nytimes.com. ^ "Duke Football vs. Western Carolina (October 13, 1990) (FB-000136) – Finding Databases – Rubenstein Library". library.duke.edu. ^ COTTON, ANTHONY (October 21, 1990). "Luck Sides Again With Maryland, 23–20 : College football: Field goal in the final minute lifts Terrapins to 23–20 victory over Duke" – via LA Times. ^ "8 thoughts ahead of Georgia Tech-Duke – Georgia Tech Sports blog". Retrieved August 5, 2018. ^ "College Football 1990 Games". www.phys.utk.edu. ^ "Duke Football Hall of Heroes: Randy Jones". Retrieved August 5, 2018. ^ "NC State Athletics – 1990 Football Schedule". gopack.com. ^ "Collector's Corner: 1990 Duke Game Was One To Remember". November 23, 2011. Retrieved August 5, 2018. ^ "North Carolina Tar Heels 1990 Football Schedule – Tar Heel Times". www.tarheeltimes.com. ^ "1991 Duke Blue Devils Schedule and Results - College Football at Sports-Reference.com". College Football at Sports-Reference.com. ^ "The Greenville News from Greenville, South Carolina on September 8, 1991 · Page 16". Retrieved August 5, 2018. ^ "1991 South Carolina Football Schedule". August 14, 2014. Retrieved August 5, 2018. ^ "Detroit Free Press from Detroit, Michigan on September 28, 1991 · Page 19". Retrieved August 5, 2018. ^ "Duke Football vs. Colgate (September 21, 1991) (FB-000145) – Finding Databases – Rubenstein Library". library.duke.edu. ^ a b "Virginia Football: Team Records". Retrieved August 5, 2018. ^ a b "Duke Football Game Notes: vs. Vanderbilt, Oct. 28, 1 PM". Retrieved August 5, 2018. ^ "1992 Duke Blue Devils Schedule and Results - College Football at Sports-Reference.com". College Football at Sports-Reference.com. ^ "Florida State 48, Duke 21". Retrieved August 5, 2018. ^ "Duke-Vanderbilt at a Glance". Retrieved August 5, 2018. ^ "1992 Vanderbilt Football Schedule". August 14, 2014. Retrieved August 5, 2018. ^ Staff, From; Reports, Wire (September 21, 1992). "College Football" – via LA Times. ^ "Football Game Notes: Duke vs. Virginia, Sept. 30, 12 noon, LFS". Retrieved August 5, 2018. ^ "Wilson Daily Times Newspaper Archives, Oct 12, 1992, p. 12". October 12, 1992. Retrieved August 5, 2018. ^ "1993 Duke Blue Devils Schedule and Results - College Football at Sports-Reference.com". College Football at Sports-Reference.com. ^ "Florida State Football – 1993 Year In Review". www.nolefan.org. ^ "COLLEGE FOOTBALL; Fortay Rallies Rutgers". September 12, 1993 – via www.nytimes.com. ^ "COLLEGE FOOTBALL: SOUTH; Duke Surges Past Army". September 19, 1993 – via www.nytimes.com. ^ "1993 Tennessee Football Schedule". August 14, 2014. Retrieved August 5, 2018. ^ "1993 - Maryland Terrapins Football Statistics and Results - Totalfootballstats.com". www.totalfootballstats.com. ^ "College Football 1993 Games". www.phys.utk.edu. ^ "Football Game Notes: vs. N.C. State, Nov. 8, 3:30 PM, ESPN 360". Retrieved August 5, 2018. ^ "North Carolina Tar Heels 1993 Football Schedule – Tar Heel Times". www.tarheeltimes.com. ^ "Duke Names Goldsmith Football Coach". upi.com. ^ Haynes, Allen. "Lenoir Rhyne football coach Fred Goldsmith to retire". Retrieved August 5, 2018. ^ "USATODAY.com – Goldsmith returns to coaching roots". usatoday30.usatoday.com. ^ "Rice Owls". Rice Owls. ^ "ROCK Magazine Fall 2004". issuu.com. ^ "Ex-Duke coach Goldsmith retires after 45 years". ESPN.com. May 3, 2011. ^ a b "1994 Duke Blue Devils". College Football at Sports-Reference.com. ^ "That time Wisconsin and Duke played a bowl game". Retrieved August 5, 2018. ^ a b c "Fred Goldsmith". College Football at Sports-Reference.com. ^ "1995 Duke Blue Devils Schedule and Results - College Football at Sports-Reference.com". College Football at Sports-Reference.com. ^ Press, From Associated (September 3, 1995). "COLLEGE FOOTBALL : Florida State Drops Hammer on Duke : ACC: No. 1 Seminoles rout Blue Devils, 70–26, remain unbeaten in conference play" – via LA Times. ^ "1995 - Duke Blue Devils Football Statistics and Results - Totalfootballstats.com". www.totalfootballstats.com. ^ Cavanaugh, Jack (September 17, 1995). "COLLEGE FOOTBALL; Dramatic Field Goal Gives Edge To Duke" – via www.nytimes.com. ^ "1995 ACC results". usatoday30.usatoday.com. ^ "North Carolina Tar Heels 1995 Football Schedule – Tar Heel Times". www.tarheeltimes.com. ^ "1997 Duke Blue Devils Schedule and Results - College Football at Sports-Reference.com". College Football at Sports-Reference.com. ^ "NC State Athletics – 1997 Football Schedule". gopack.com. ^ a b c d "1997 ACC results". usatoday30.usatoday.com. ^ "Game Notes: at Army, Sept. 12, 12 PM, CBS College Sports". Retrieved August 5, 2018. ^ "Duke Football Game Notes: at Navy, Sept. 22, 1 PM, CSTV". Retrieved August 5, 2018. ^ "Florida State Crushes Duke". Retrieved August 5, 2018. ^ "Virginia vs. Duke Football Preview". Retrieved August 5, 2018. ^ "North Carolina Tar Heels 1997 Football Schedule – Tar Heel Times". www.tarheeltimes.com. ^ "1998 Duke Blue Devils Schedule and Results - College Football at Sports-Reference.com". College Football at Sports-Reference.com. ^ "Duke looks to break 20-year-old streak by going 3–0". September 12, 2014. Retrieved August 5, 2018. ^ "Duke 44, Northwestern 10". Retrieved August 5, 2018. ^ News, A. B. C. (January 6, 2006). "Virus Passed Through Football Game". ABC News. ^ a b "1998 ACC results". usatoday30.usatoday.com. ^ "Demon Deacons Downed by Duke, 19–16". Retrieved August 5, 2018. ^ "Football Can Claim Winning Season In ACC With Victory Over Duke". Retrieved August 5, 2018. ^ http://www.washingtontimes.com, The Washington Times. "An uncommon occurrence – Washington Times". www.washingtontimes.com. ^ "North Carolina Tar Heels 1998 Football Schedule – Tar Heel Times". www.tarheeltimes.com. ^ Beard, Aaron. "Years after Duke football turmoil, Goldsmith back on the sidelines – Online Athens". onlineathens.com. ^ Reports, From Staff and Wire. "Duke fires Goldsmith; Sooners to get Stoops - chronicle.augusta.com". chronicle.augusta.com. ^ "Fred Goldsmith Coaching Record - College Football at Sports-Reference.com". College Football at Sports-Reference.com. ^ "Duke Hires Gators Asst. Franks". cbsnews.com. December 2, 1998. ^ brent.woronoff@news-jrnl.com, Brent Woronoff. "Former UF assistant, Duke head coach Franks 'elevates' B-CU staff". Retrieved August 5, 2018. ^ "1996 National Champions (History) – Florida Gators". floridagators.com. ^ Press, Associated. "Florida assistant Carl Franks to be new Duke coach - chronicle.augusta.com". chronicle.augusta.com. ^ "1999 Duke Blue Devils Schedule and Results - College Football at Sports-Reference.com". College Football at Sports-Reference.com. ^ "Garrard, East Carolina Are Too Much For Duke". Retrieved August 5, 2018. ^ "Northwestern Downs Duke In Overtime, 15–12". Northwestern University. ^ "1999 Vanderbilt Football Schedule". August 13, 2014. Retrieved August 5, 2018. ^ Thomas, Bob. "FSU half-steps past Duke - Jacksonville.com". jacksonville.com. ^ "FSU Football Crushes Duke, 51–23". October 2, 1999. Retrieved August 5, 2018. ^ "Football Suffers Bizarre Double-OT Loss To Duke". Retrieved August 5, 2018. ^ "NC State Athletics – 1999 Football Schedule". gopack.com. ^ "Duke Football Rallies To Upset Maryland, 25–22". Retrieved August 5, 2018. ^ "Final 1999 Clemson Football Stats". January 5, 2000. Retrieved August 5, 2018. ^ "Football Game Notes – Wake Forest vs. Duke". Retrieved August 5, 2018. ^ "North Carolina Tar Heels 1999 Football Schedule – Tar Heel Times". www.tarheeltimes.com. ^ "2000 Duke Blue Devils Schedule and Results - College Football at Sports-Reference.com". College Football at Sports-Reference.com. ^ "2001 Duke Blue Devils Schedule and Results - College Football at Sports-Reference.com". College Football at Sports-Reference.com. ^ "After snapping 22-game losing streak, it's finally Duke's turn to laugh - USATODAY.com". usatoday.com. ^ a b "Carl Franks". College Football at Sports-Reference.com. ^ "ESPNMAG.com – Duke bedeviled". www.espn.com. ^ "2002 Duke Blue Devils Schedule and Results - College Football at Sports-Reference.com". College Football at Sports-Reference.com. ^ "NCAA Division I College Football – East Carolina vs. Duke". usatoday30.usatoday.com. ^ "East Carolina vs. Duke – Game Recap – August 31, 2002 – ESPN". ESPN.com. ^ "Football Drops Duke, 40–3". University of Louisville. ^ "Northwestern 26, Duke 21". Retrieved August 5, 2018. ^ "NCAA Division I College Football – Duke vs. Northwestern". usatoday30.usatoday.com. ^ "Duke vs. Florida State – Game Recap – September 21, 2002 – ESPN". ESPN.com. ^ "Duke shreds hopes, defense of Navy in a 43–17 pounding". Retrieved August 5, 2018. ^ "2002 - Duke Blue Devils Football Statistics and Results - Totalfootballstats.com". www.totalfootballstats.com. ^ "2003 Duke Blue Devils Schedule and Results - College Football at Sports-Reference.com". College Football at Sports-Reference.com. ^ "Duke vs. Virginia – Game Recap – August 31, 2003 – ESPN". ESPN.com. ^ "Western Carolina vs. Duke – Game Recap – September 6, 2003 – ESPN". ESPN.com. ^ "Rice vs. Duke – Game Recap – September 13, 2003 – ESPN". ESPN.com. ^ WRAL. "Franks Fired As Duke's Football Coach :: WRAL.com". Retrieved August 5, 2018. ^ "Ted Roof bio". Retrieved August 5, 2018. ^ Callos, Alex. "The 25 Worst College Football Programs Ever". Retrieved August 5, 2018. ^ a b c "Duke hires Roof as football coach after 5-game test". philly-archives. ^ "ESPN.com – Page2 – Worst college football teams of all time". www.espn.com. ^ "Duke News Briefs: June 27, 2003". Retrieved August 5, 2018. ^ a b "ESPN". ESPN.com. ^ "Ted Roof Bio – AuburnTigers.com – Official Athletics Site of the Auburn Tigers". auburntigers.com. ^ "2004 Duke Blue Devils Schedule and Results - College Football at Sports-Reference.com". College Football at Sports-Reference.com. ^ "Duke vs. Navy – Game Recap – September 4, 2004 – ESPN". ESPN.com. ^ "Duke vs. Connecticut – Game Recap – September 11, 2004 – ESPN". ESPN.com. ^ "Duke vs. Virginia Tech – Game Recap – September 18, 2004 – ESPN". ESPN.com. ^ "Maryland vs. Duke – Game Recap – September 25, 2004 – ESPN". ESPN.com. ^ "The Citadel vs. Duke – Game Recap – October 2, 2004 – ESPN". ESPN.com. ^ "Duke vs. Georgia Tech – Game Recap – October 16, 2004 – ESPN". ESPN.com. ^ "Virginia vs. Duke – Game Recap – October 23, 2004 – ESPN". ESPN.com. ^ "Wake Forest Slips Past Duke, 24–22". Retrieved August 5, 2018. ^ "Duke vs. Florida State – Game Recap – November 6, 2004 – ESPN". ESPN.com. ^ "Clemson vs. Duke – Game Recap – November 13, 2004 – ESPN". ESPN.com. ^ "North Carolina Tar Heels 2004 Football Schedule – Tar Heel Times". www.tarheeltimes.com. ^ "2005 Duke Blue Devils Schedule and Results - College Football at Sports-Reference.com". College Football at Sports-Reference.com. ^ "Duke vs. East Carolina – Game Recap – September 3, 2005 – ESPN". ESPN.com. ^ "Virginia Tech vs. Duke – Game Recap – September 10, 2005 – ESPN". ESPN.com. ^ "VMI vs. Duke – Game Recap – September 17, 2005 – ESPN". ESPN.com. ^ "Duke vs. Virginia – Game Recap – September 24, 2005 – ESPN". ESPN.com. ^ "Navy vs. Duke – Game Recap – October 1, 2005 – ESPN". ESPN.com. ^ "Duke vs. Miami – Game Recap – October 8, 2005 – ESPN". ESPN.com. ^ "Georgia Tech vs. Duke – Game Recap – October 15, 2005 – ESPN". ESPN.com. ^ "Florida State Seminoles Official Athletic Site". Florida State Seminoles. ^ "Wake Forest vs. Duke – Game Recap – October 29, 2005 – ESPN". ESPN.com. ^ "Duke vs. Clemson – Game Recap – November 5, 2005 – ESPN". ESPN.com. ^ "Duke vs. North Carolina – Game Recap – November 19, 2005 – ESPN". ESPN.com. ^ "2006 Duke Blue Devils Schedule and Results - College Football at Sports-Reference.com". College Football at Sports-Reference.com. ^ a b "2007 Duke Blue Devils Schedule and Results - College Football at Sports-Reference.com". College Football at Sports-Reference.com. ^ "Connecticut vs. Duke – Game Recap – September 1, 2007 – ESPN". ESPN.com. ^ "Duke vs. Virginia – Game Recap – September 8, 2007 – ESPN". ESPN.com. ^ "Duke vs. Northwestern – Game Summary – September 15, 2007 – ESPN". ESPN.com. ^ "Duke vs. Miami – Game Recap – September 29, 2007 – ESPN". ESPN.com. ^ "Demon Deacons Defeat Blue Devils, 41–36". Retrieved August 5, 2018. ^ "Virginia Tech vs. Duke – Game Recap – October 13, 2007 – ESPN". ESPN.com. ^ "Duke vs. Florida State – Game Recap – October 28, 2007 – ESPN". ESPN.com. ^ "Clemson vs. Duke – Game Recap – November 3, 2007 – ESPN". ESPN.com. ^ "Blue Devils Fall To Georgia Tech, 41–24". Retrieved August 5, 2018. ^ "Duke vs. Notre Dame – Game Recap – November 17, 2007 – ESPN". ESPN.com. ^ "North Carolina Postgame Notes vs. Duke, Nov. 24, 2007". Retrieved August 5, 2018. ^ "Sources: Duke hires Vols' Cutcliffe as new coach". ESPN.com. December 14, 2007. ^ "Low: Duke offers Cutcliffe second chance". ESPN.com. January 15, 2008. ^ "Source: Duke hires Cutcliffe – Online Athens". onlineathens.com. ^ "A Cut Above: Duke coach serves as mentor to both Peyton and Eli". Retrieved August 5, 2018. ^ "David Cutcliffe". August 17, 2014. Retrieved August 5, 2018. ^ "Duke Football Was Once So Pathetic It Helped Them Win A Lawsuit Against UofL – The Cardinal Connect". www.thecardinalconnect.com. ^ "2008 Duke Blue Devils Schedule and Results - College Football at Sports-Reference.com". College Football at Sports-Reference.com. ^ "2009 Duke Blue Devils Schedule and Results - College Football at Sports-Reference.com". College Football at Sports-Reference.com. ^ Evans, Thayer (September 29, 2017). "U.S.C. Hires Kiffin to Replace Carroll" – via www.nytimes.com. ^ "Tennessee Volunteers' search focused on David Cutcliffe, sources say". ESPN.com. Retrieved January 16, 2010. ^ Glier, Ray (January 15, 2010). "Cutcliffe will stay at Duke". New York Times. Retrieved January 16, 2010. ^ "Derek Dooley named Tennessee head coach". ESPN.com. January 15, 2010. ^ "Cutcliffe staying at Duke". Durham Herald-Sun. Archived from the original on July 25, 2011. Retrieved January 16, 2010. ^ "Cutcliffe's loyalty rewards Duke, ACC". ESPN.com. Retrieved January 16, 2010. ^ "2010 Duke Blue Devils Schedule and Results - College Football at Sports-Reference.com". College Football at Sports-Reference.com. ^ "2011 Duke Blue Devils Schedule and Results - College Football at Sports-Reference.com". College Football at Sports-Reference.com. ^ "Cincinnati Bearcats vs Duke Blue Devils – Recap". ESPN.com. ^ "2012 Duke Blue Devils Schedule and Results - College Football at Sports-Reference.com". College Football at Sports-Reference.com. ^ "Duke's Cutcliffe agrees to long-term extension". Retrieved August 5, 2018. ^ "Duke Blue Devils vs Virginia Tech Hokies – Recap". ESPN.com. ^ "Record-setting day leads to historic win for Duke football". The Duke Chronicle. ^ "NC State Wolfpack vs Duke Blue Devils – Recap". ESPN.com. ^ "Miami vs. Duke – Game Recap – November 16, 2013 – ESPN". ESPN.com. ^ "The AP Top 25 Poll". College Football. Archived from the original on November 20, 2013. ^ "Duke vs. Wake Forest – Game Recap – November 23, 2013 – ESPN". ESPN.com. ^ "The AP Top 25 Poll". College Football. ^ "How to watch the ACC title game". Retrieved August 5, 2018. ^ "Florida State vs. Auburn – Game Recap – January 6, 2014 – ESPN". ESPN.com. ^ "Duke vs. Florida State – Game Recap – December 7, 2013 – ESPN". ESPN.com. 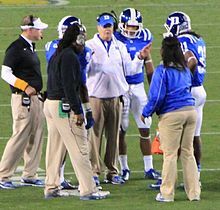 ^ "Cutcliffe Named National Coach of the Year". goduke.com. ^ Ellis, Zac. "Chick-fil-A Bowl breakdown: Duke Blue Devils vs. Texas A&M Aggies". Retrieved August 5, 2018. ^ "Duke Blue Devils vs Texas A&M Aggies – Recap". ESPN.com. ^ Ellis, Zac. "Florida Gators hire Kurt Roper as new offensive coordinator". Retrieved August 5, 2018. ^ "Duke to name Scottie Montgomery Offensive Coordinator". Retrieved August 5, 2018. ^ "2014 Duke Blue Devils Schedule and Results - College Football at Sports-Reference.com". College Football at Sports-Reference.com. ^ "Elon vs. Duke – Game Recap – August 30, 2014 – ESPN". ESPN.com. ^ "Duke vs. Troy – Game Recap – September 6, 2014 – ESPN". ESPN.com. ^ "Kansas vs. Duke – Game Recap – September 13, 2014 – ESPN". ESPN.com. ^ "Tulane vs. Duke – Game Recap – September 20, 2014 – ESPN". ESPN.com. ^ "Duke vs. Miami – Game Summary – September 27, 2014 – ESPN". ESPN.com. ^ "Duke vs. Georgia Tech – Game Recap – October 11, 2014 – ESPN". ESPN.com. ^ "Virginia vs. Duke – Game Recap – October 18, 2014 – ESPN". ESPN.com. ^ "Duke vs. Pittsburgh – Game Recap – November 1, 2014 – ESPN". ESPN.com. ^ "Duke vs. Syracuse – Game Recap – November 8, 2014 – ESPN". ESPN.com. ^ "Virginia Tech vs. Duke – Game Recap – November 15, 2014 – ESPN". ESPN.com. ^ "North Carolina vs. Duke – Game Recap – November 20, 2014 – ESPN". ESPN.com. ^ "Wake Forest falls to Duke in finale, 41–21". Retrieved August 5, 2018. ^ Rickman, Martin. "Arizona State vs. Duke: Sun Bowl Preview". Retrieved August 5, 2018. ^ "Arizona State vs. Duke – Game Recap – December 27, 2014 – ESPN". ESPN.com. ^ a b c "Jamison Crowder Bio". Retrieved August 5, 2018. ^ "Michigan Football Coaching Candidates: Cutcliffe, Miles, Harbaugh Get Calls, But Has the Real Search Begun?". University Herald. ^ Wire, SI. "Michigan hires Jim Harbaugh as new head coach". Retrieved August 5, 2018. ^ "Duke head coach David Cutcliffe was contacted by Louisville". BlueDevilLair. ^ "Petrino accepts job, returns to Louisville". Retrieved August 5, 2018. ^ "2015 Duke Blue Devils Schedule and Results - College Football at Sports-Reference.com". College Football at Sports-Reference.com. ^ "Duke vs. Tulane – Game Recap – September 3, 2015 – ESPN". ESPN.com. ^ "North Carolina Central vs. Duke – Game Summary – September 12, 2015 – ESPN". ESPN.com. ^ "Northwestern vs. Duke – Game Recap – September 19, 2015 – ESPN". ESPN.com. ^ "Georgia Tech vs. Duke – Game Recap – September 26, 2015 – ESPN". ESPN.com. ^ "Boston College vs. Duke – Game Recap – October 3, 2015 – ESPN". ESPN.com. ^ "Duke vs. Army – Game Recap – October 10, 2015 – ESPN". ESPN.com. ^ "Duke vs. Virginia Tech – Game Recap – October 24, 2015 – ESPN". ESPN.com. ^ "Miami vs. Duke – Game Recap – October 31, 2015 – ESPN". ESPN.com. ^ a b "A moment-by-moment breakdown of Miami's miracle". Retrieved August 5, 2018. ^ Wire, SI. "Referees from Miami vs. Duke suspended two games". Retrieved August 5, 2018. ^ "Duke vs. North Carolina – Game Recap – November 7, 2015 – ESPN". ESPN.com. ^ "Pittsburgh vs. Duke – Game Recap – November 14, 2015 – ESPN". ESPN.com. ^ "Duke vs. Virginia – Game Recap – November 21, 2015 – ESPN". ESPN.com. ^ "Duke vs. Wake Forest – Game Recap – November 28, 2015 – ESPN". ESPN.com. ^ "Indiana vs. Duke – Game Recap – December 26, 2015 – ESPN". ESPN.com. ^ "ECU taps Duke OC Montgomery as head coach". Retrieved August 5, 2018. ^ "Zac Roper promoted to become Duke football's new offensive coordinator". Retrieved August 5, 2018. ^ "Brooks Field at Wallace Wade Stadium". Retrieved August 5, 2018. ^ a b c d e f g "Duke to Launch Wallace Wade Stadium Renovations". Retrieved August 5, 2018. ^ a b c d e f "Stadium Renovations Enhance Football Experience". Retrieved August 5, 2018. ^ "Duke University Wallace Wade Stadium Renovation – The Beck Group". Retrieved August 5, 2018. ^ "Commercial Construction & Architecture I The Beck Group". The Beck Group. ^ "James Coleman". James Coleman. ^ "2016 Duke Blue Devils Schedule and Results - College Football at Sports-Reference.com". College Football at Sports-Reference.com. ^ "North Carolina Central vs. Duke – Game Recap – September 3, 2016 – ESPN". ESPN.com. ^ "Wake Forest vs. Duke – Game Recap – September 10, 2016 – ESPN". ESPN.com. ^ "Duke vs. Northwestern – Game Recap – September 17, 2016 – ESPN". ESPN.com. ^ "Duke vs. Notre Dame – Game Recap – September 24, 2016 – ESPN". ESPN.com. ^ "Things keep getting worse for Notre Dame following 38–35 loss to Duke". Retrieved August 5, 2018. ^ "Notre Dame just lost to Duke as a 21-point home favorite. Heads to roll?". Retrieved August 5, 2018. ^ "Virginia vs. Duke – Game Recap – October 1, 2016 – ESPN". ESPN.com. ^ "Army vs. Duke – Game Recap – October 8, 2016 – ESPN". ESPN.com. ^ "Duke vs. Louisville – Game Recap – October 14, 2016 – ESPN". ESPN.com. ^ "Duke vs. Georgia Tech – Game Recap – October 29, 2016 – ESPN". ESPN.com. ^ "Virginia Tech vs. Duke – Game Recap – November 5, 2016 – ESPN". ESPN.com. ^ "North Carolina vs. Duke – Game Recap – November 10, 2016 – ESPN". ESPN.com. ^ "Duke vs. Pittsburgh – Game Recap – November 19, 2016 – ESPN". ESPN.com. ^ "Duke vs. Miami – Game Recap – November 26, 2016 – ESPN". ESPN.com. ^ "Duke rewards Cutcliffe with 2-year extension". Retrieved August 5, 2018. ^ "2017 Duke Blue Devils Schedule and Results - College Football at Sports-Reference.com". College Football at Sports-Reference.com. ^ "North Carolina Central vs. Duke - Game Recap - September 2, 2017 - ESPN". ESPN.com. ^ "Northwestern vs. Duke - Game Recap - September 9, 2017 - ESPN". ESPN.com. ^ "Baylor vs. Duke - Game Recap - September 16, 2017 - ESPN". ESPN.com. ^ "Duke vs. North Carolina - Game Recap - September 23, 2017 - ESPN". ESPN.com. ^ "Miami vs. Duke - Game Recap - September 29, 2017 - ESPN". ESPN.com. ^ "Duke vs. Virginia - Game Recap - October 7, 2017 - ESPN". ESPN.com. ^ "Pittsburgh vs. Duke - Game Recap - October 21, 2017 - ESPN". ESPN.com. ^ a b "Duke vs. Army - Game Recap - November 11, 2017 - ESPN". ESPN.com. ^ "Georgia Tech vs. Duke - Game Recap - November 18, 2017 - ESPN". ESPN.com. ^ "Duke vs. Wake Forest - Game Recap - November 25, 2017 - ESPN". ESPN.com. ^ "Duke vs. Northern Illinois - Game Recap - December 26, 2017 - ESPN". ESPN.com. ^ 2016 NCAA Football Bowl Subdivision Records (PDF). Indianapolis, IN: The National Collegiate Athletic Association. August 2016. Retrieved February 17, 2017. ^ "1936 National Championships". College Football Data Warehouse. Archived from the original on February 11, 2010. ^ "1941 National Championships". College Football Data Warehouse. ^ "ACC Strips Duke Of 1965 ACC Crown". goduke.com. ^ Wiseman, Steve. "Duke football looks ahead to refurbished Wallace Wade". www.heraldsun.com. Retrieved September 25, 2014. ^ "Duke Wallace Wade Stadium". Retrieved December 21, 2016. ^ a b c "Duke Gang". Duke Gang. Retrieved April 18, 2017. ^ "Duke Blue Devils Football Schedules and Future Schedules". fbschedules.com. Retrieved April 29, 2018.